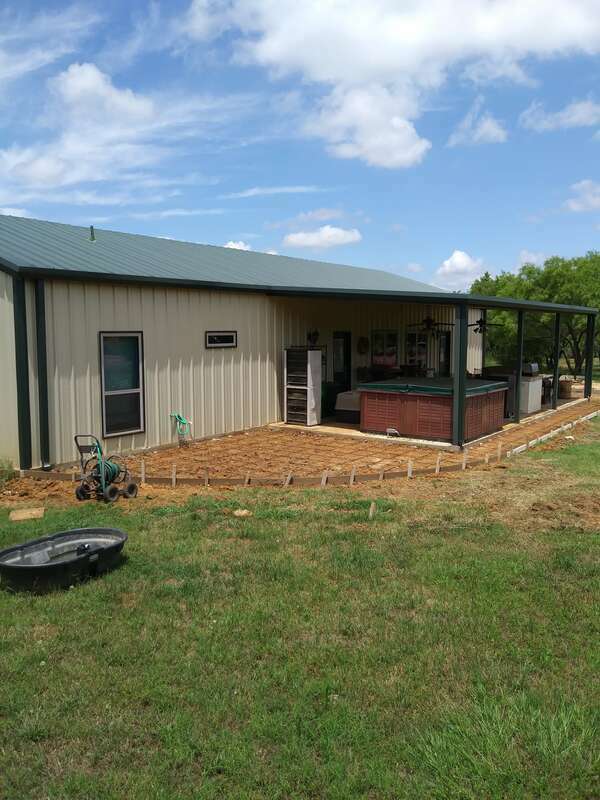 Detached Metal Building Garage Addition and other Improvement Projects around our Texas Barndominium Homestead! 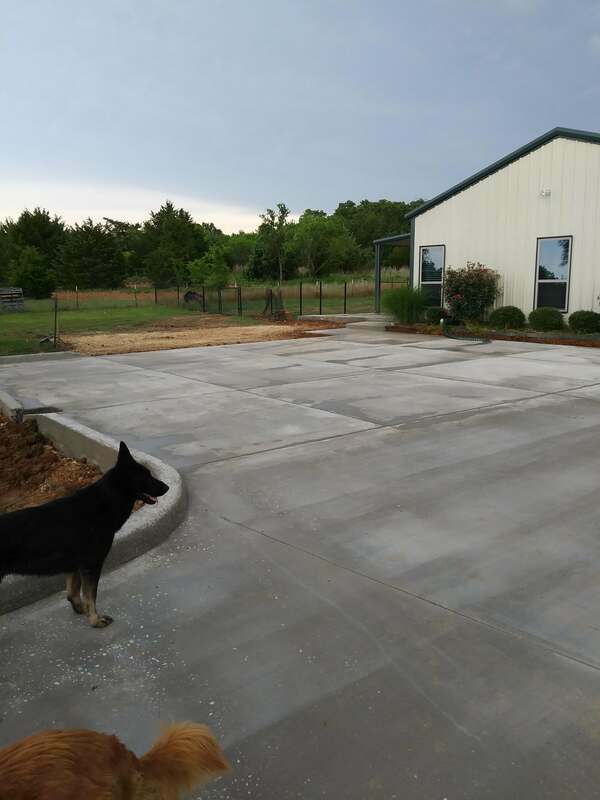 Concrete parking and patio addition along with asphalt paving the driveway! Give it a Social Share! 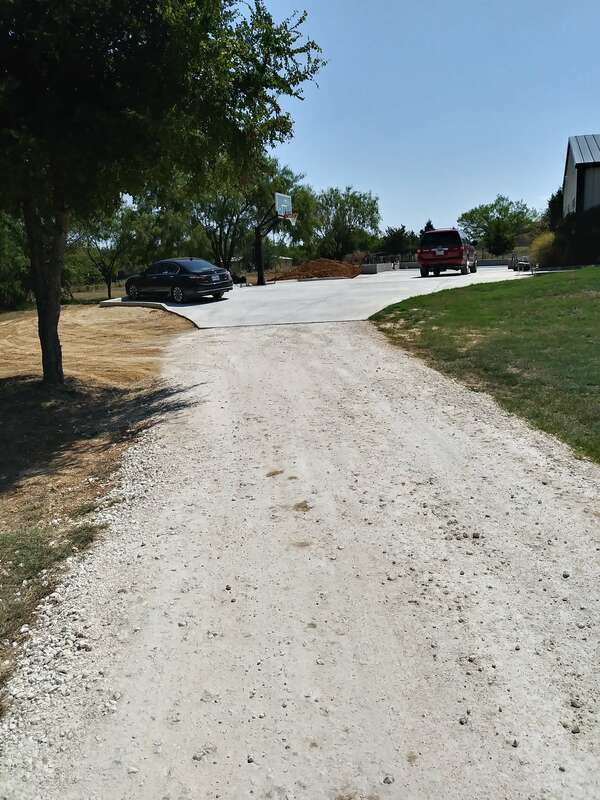 Our driveway and parking area had been road base gravel since 2011 when we built our Texas barndominium home. It held up well and served its purpose, but we were ready to improve it. 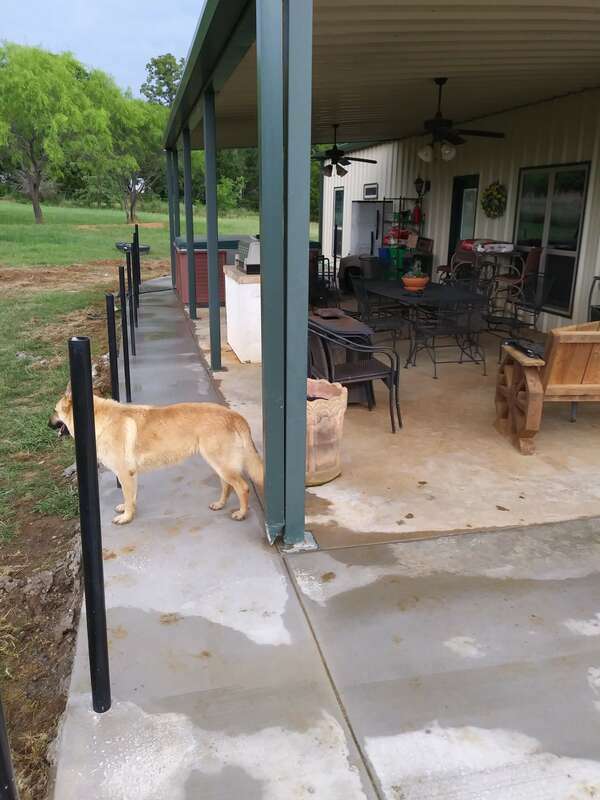 ​I was also motivated to design a way to keep our three large dogs off of the back patio. 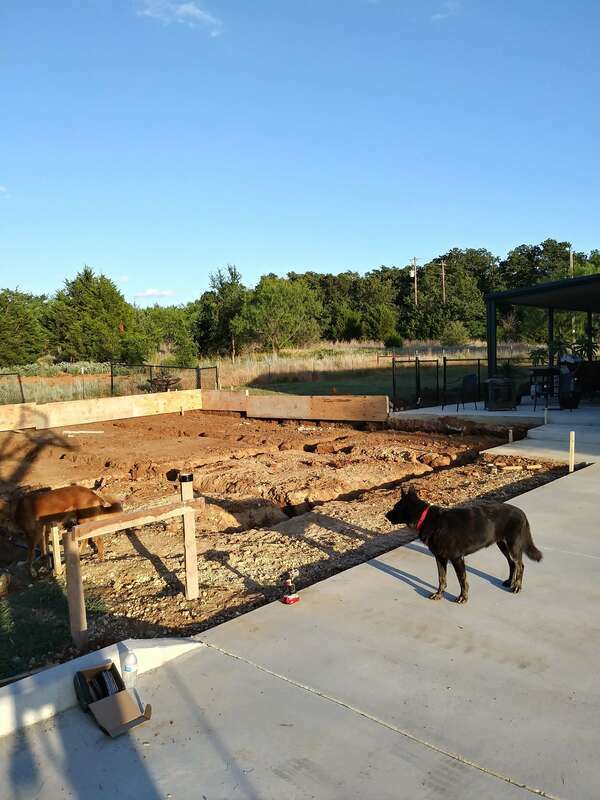 The dogs made it so that we rarely spent much time on the back patio. They were always right up on us jumping with excitement, especially when they were younger pups. 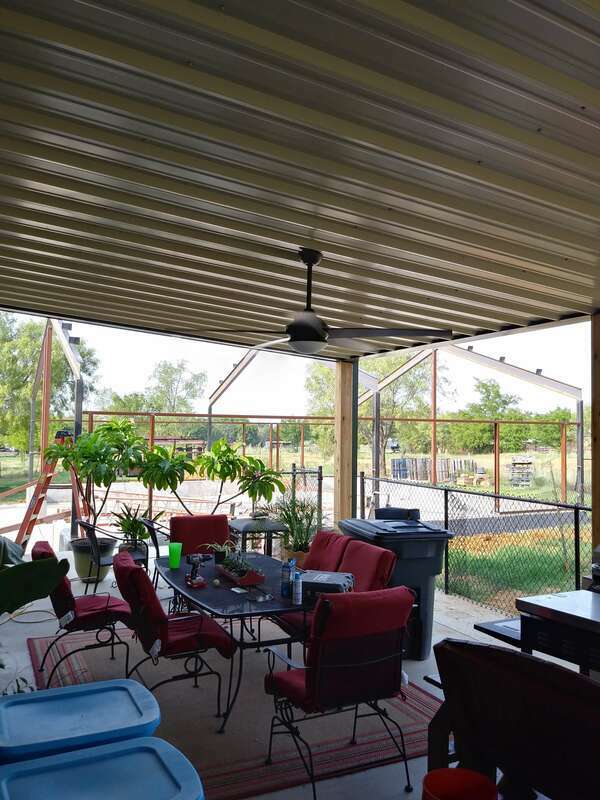 The solution was to extend the back patio so we could put a fence around it. 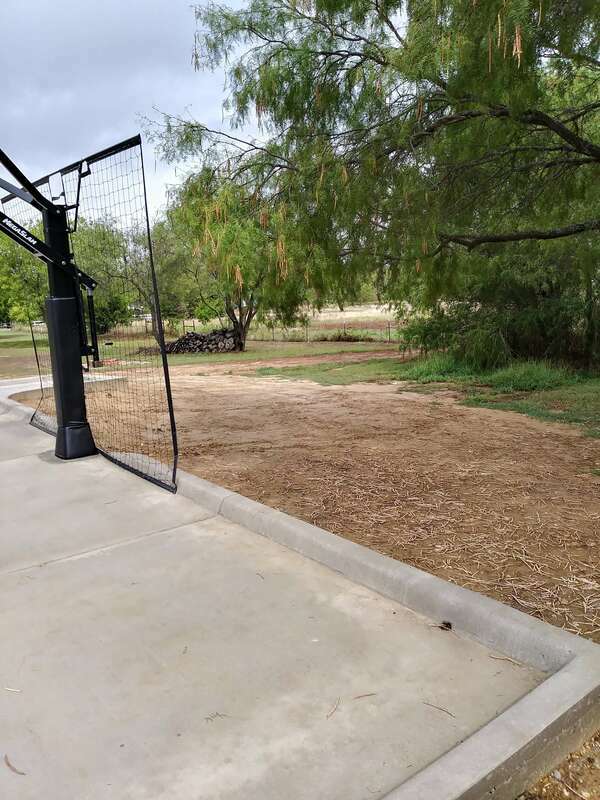 We also wanted to create permanent walkways (instead of stepping stones we had up until now) to both the front and back doors, and to create a parking area with a basketball goal. 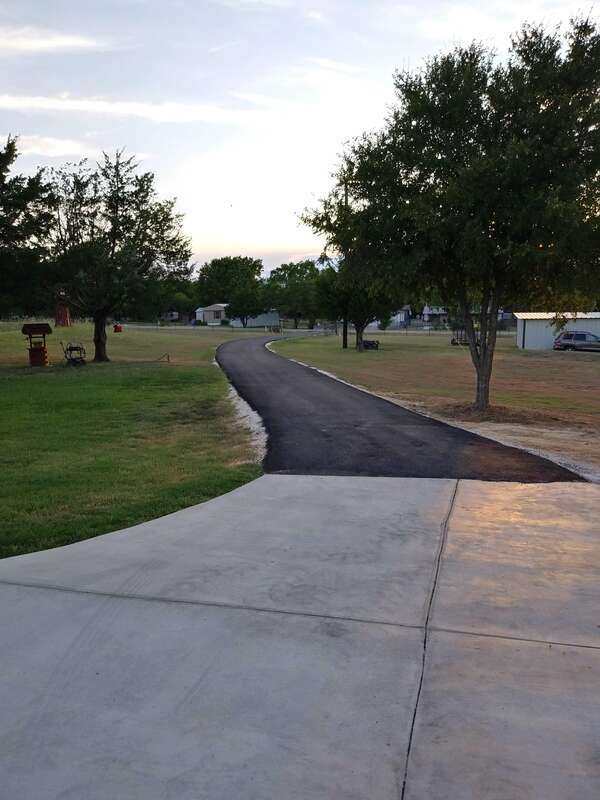 We also wanted to asphalt the driveway out the the street. We have a budding basketball player that was anxious for solid ground to practice basketball on. Our two boys have had a portable basketball goal in the yard for years, but you really couldn't dribble on the grass. 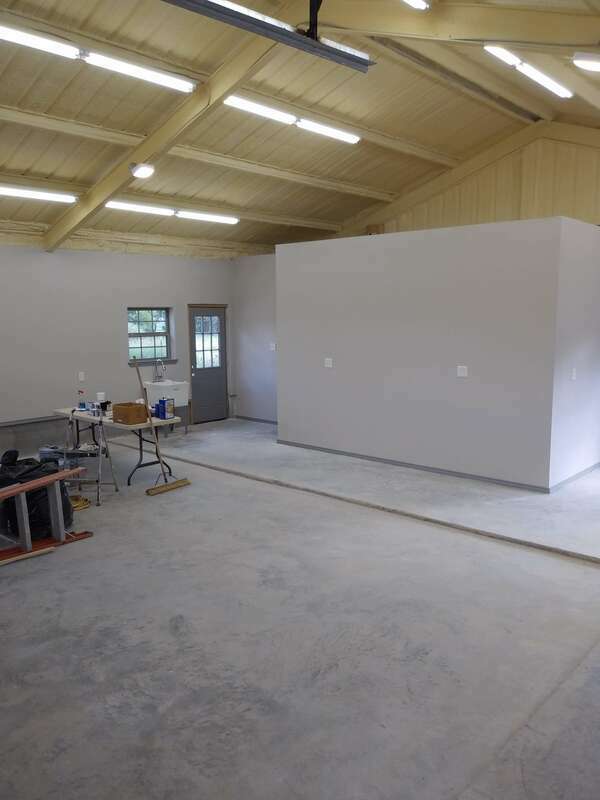 We marked off the areas for concrete addition with orange construction spray paint and ended up changing things up a few times. 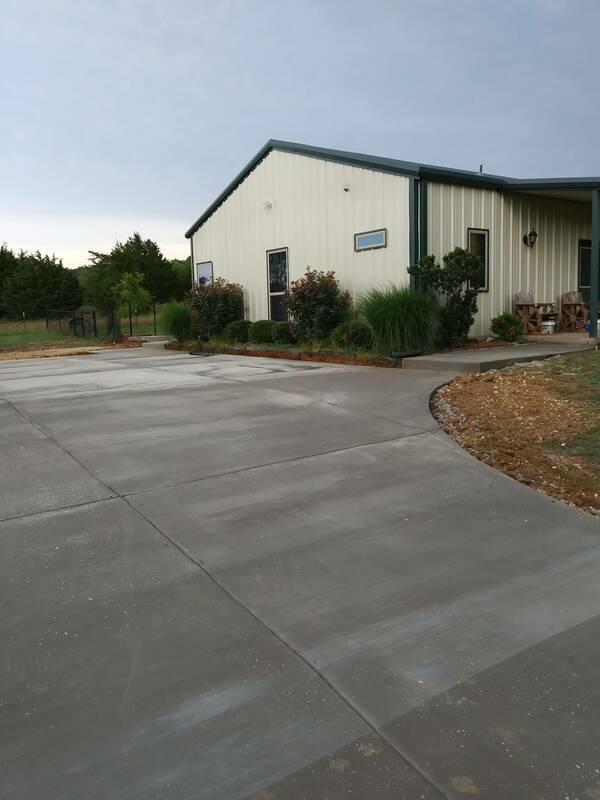 We found a great concrete business that provided a very fair estimate. The two other bids we received were one higher and one lower. 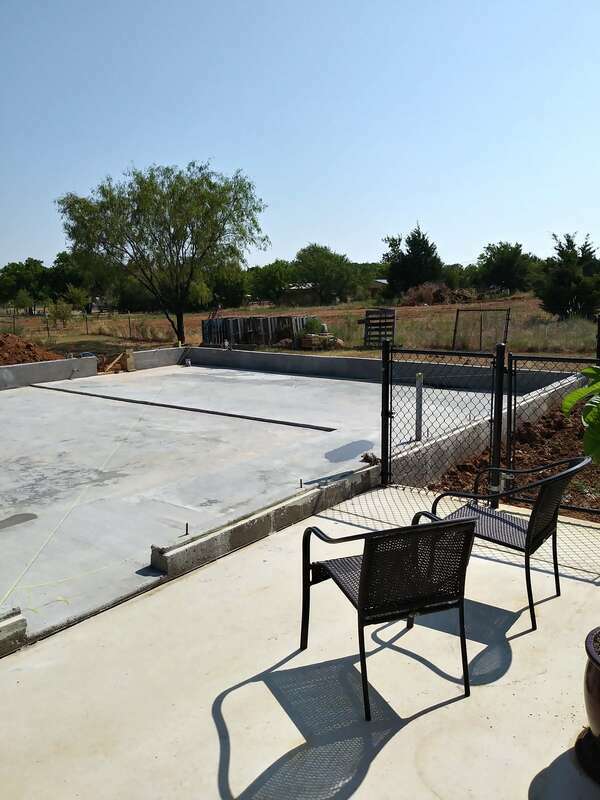 Neither of those concrete contractors were as knowledgeable or helpful as the guy we went with. The guy we went with also had his own excavation equipment and the other two said they would rent equipment. 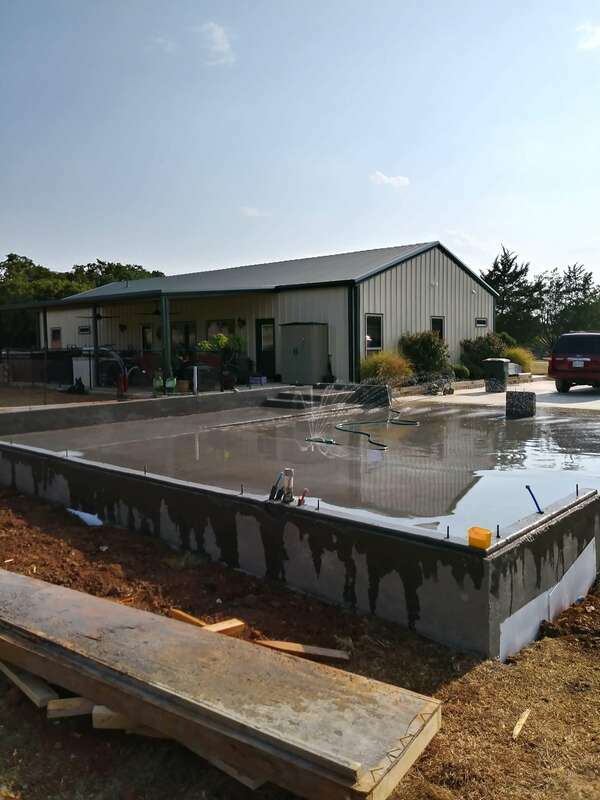 Within a few days the concrete crew was onsite ready to get started. 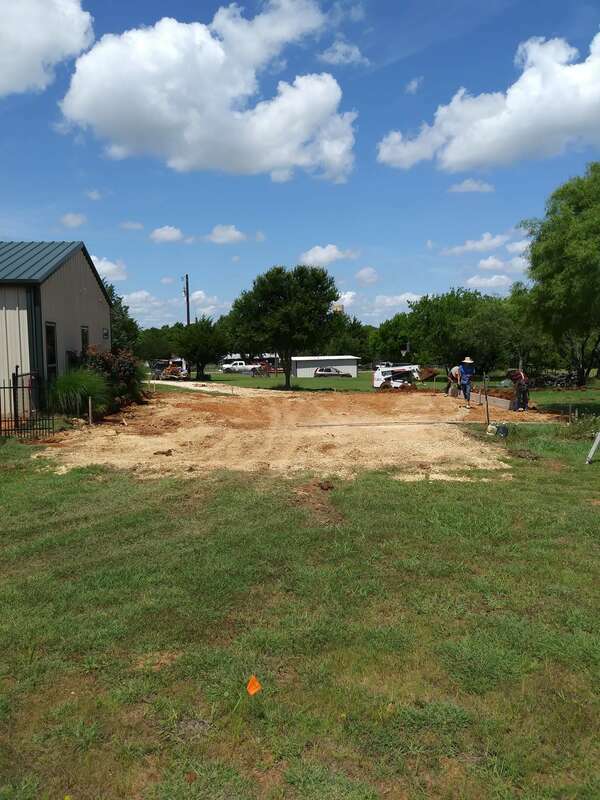 There was quite a bit of dirt work necessary to get the parking area grade to where it wasn't sloped too much for basketball. 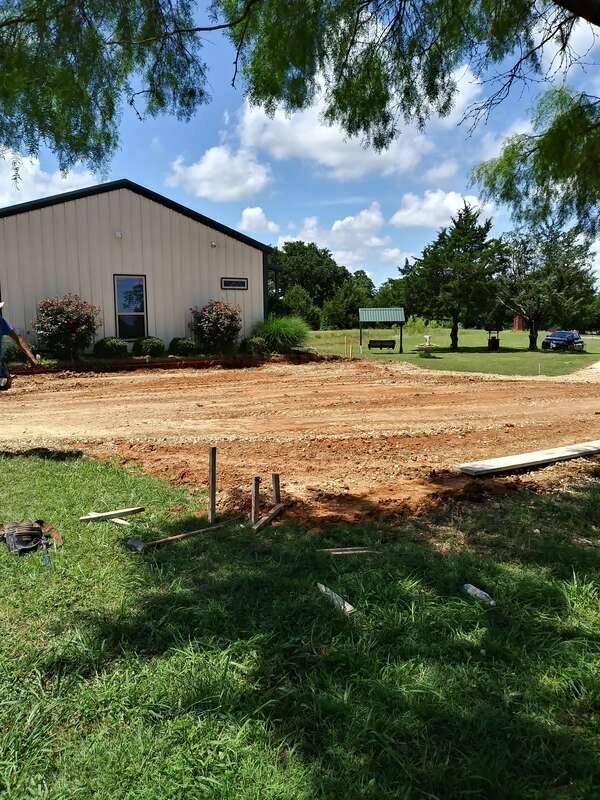 We ended up bringing in a few truck loads of dirt to assist in accomplishing that, which cost about $750 extra that I hadn't planned for. 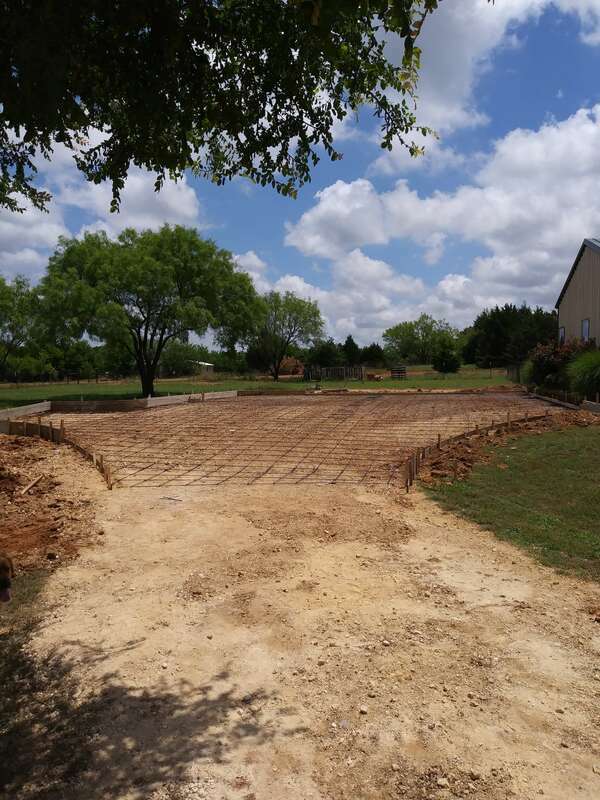 The forms were set the next day and rebar steel was placed on 18 inch centers. 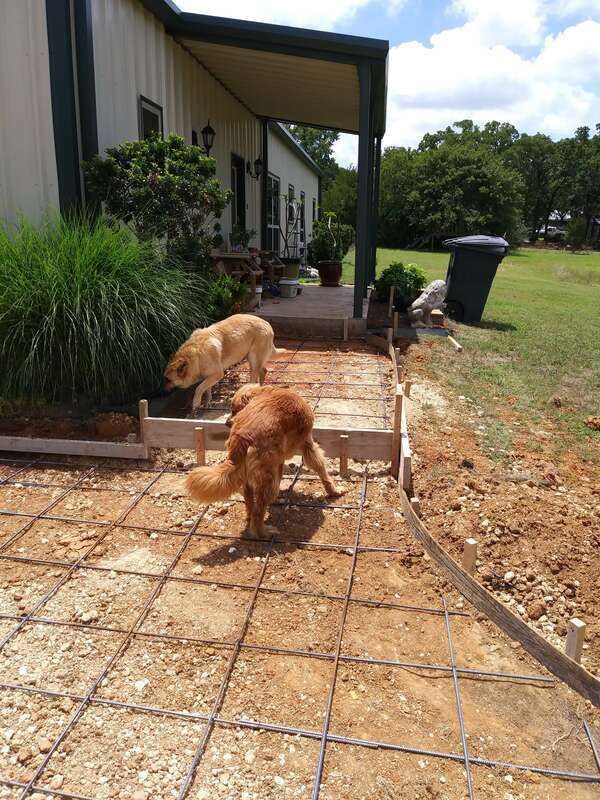 I had negotiated the exact rebar steel configuration in advance, as I wanted plenty of steel in it since everything was either connecting to the house foundation or will be driven on by heavy vehicles. 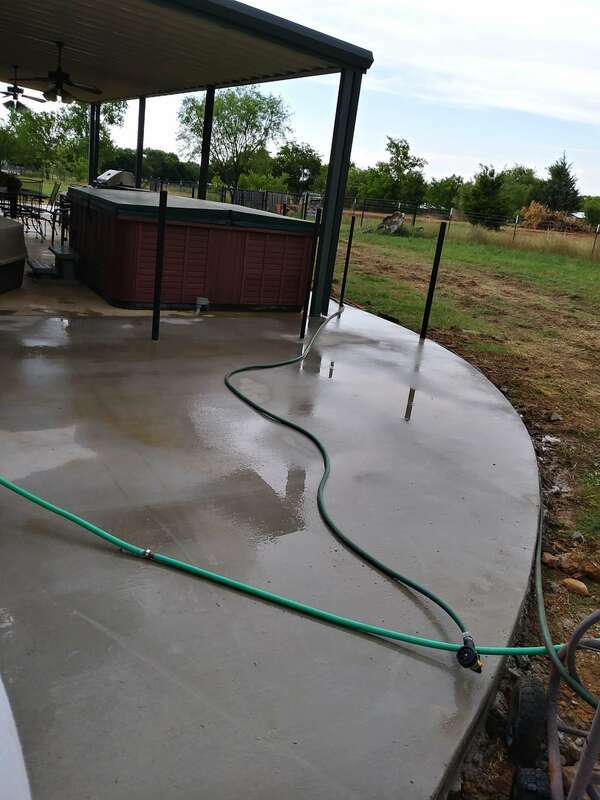 I specified 3500 psi concrete with fiber mesh added to the concrete mix. The high psi concrete and the fiber mesh serve as a deterrent to hair line surface cracking. I also had them create numerous structured lines within the concrete in hopes any hairline cracking would locate there. 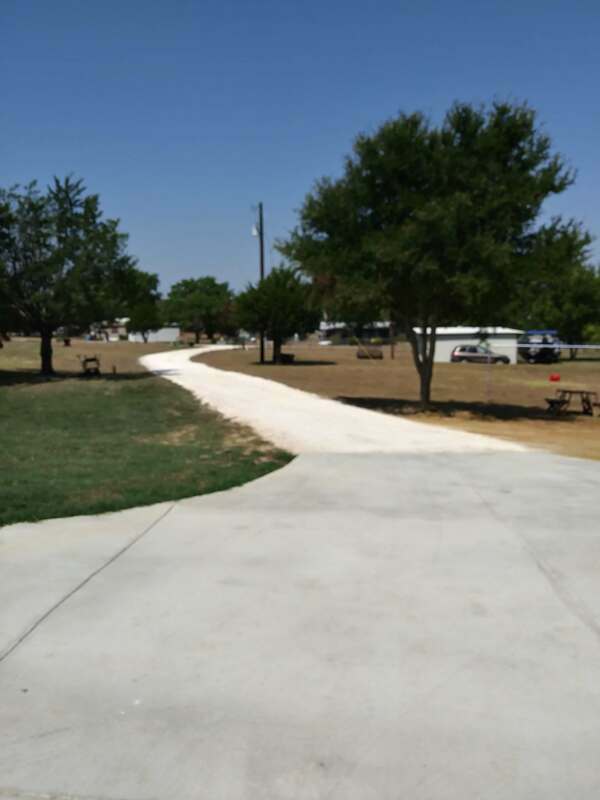 ​Concrete shrinks when it dries, so hairline cracks are very common even with a great installation. We were also pouring concrete in the Texas heat of June so I wanted to take every precaution possible. 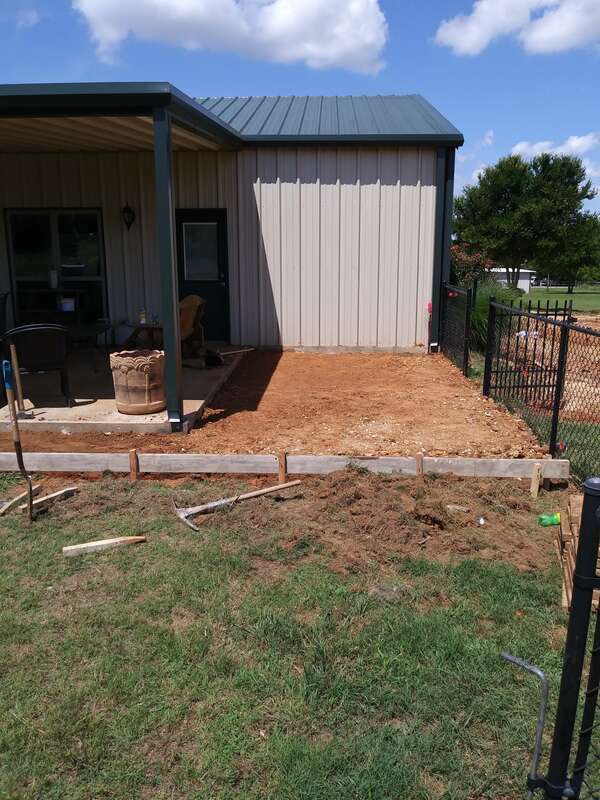 ​I had to get my fence posts in the ground around the patio for the chain link fence I planned to install. 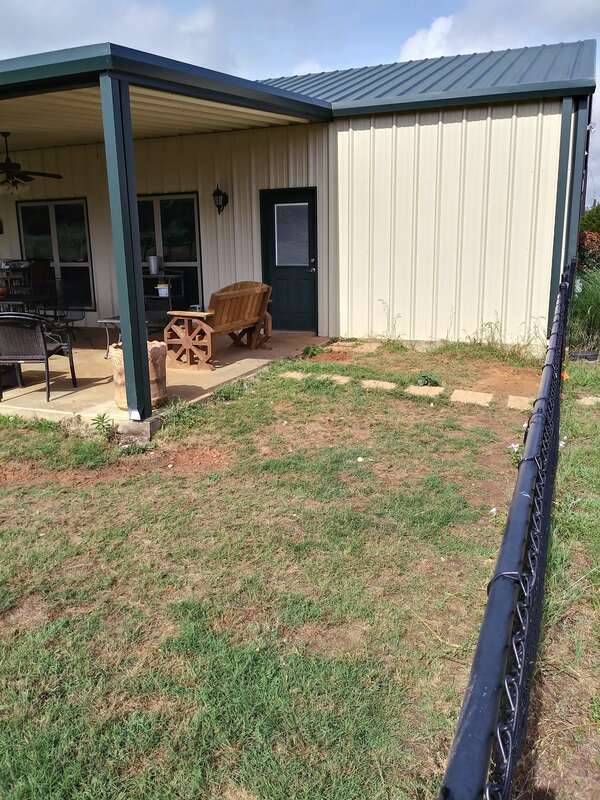 I wanted the fence to be on top of the patio addition so there wouldn't be an issue with grass growing up between the fence. That way we can have a clean line of edging when mowing. 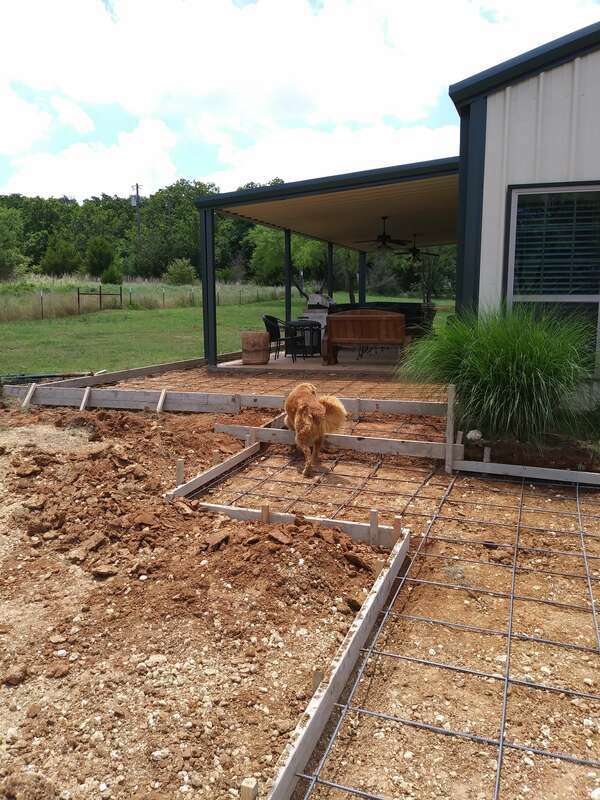 I got the posts in the night before we were to pour concrete the next day. The next morning at about 6:00 am the first concrete truck pulled in. The concrete crew did excellent work and they were putting the finishing touches on by about 11:30 am. After the concrete was finished and set for a couple of hours I applied water several times throughout the remainder of the day. I have always heard it helps slow the concrete curing process and in turn makes it stronger once cured. Next came the asphalt on the driveway all the way out to the street. The road base rock we've had for about seven years had held up well with almost no ruts or potholes to speak of. It made a great base for the new asphalt. 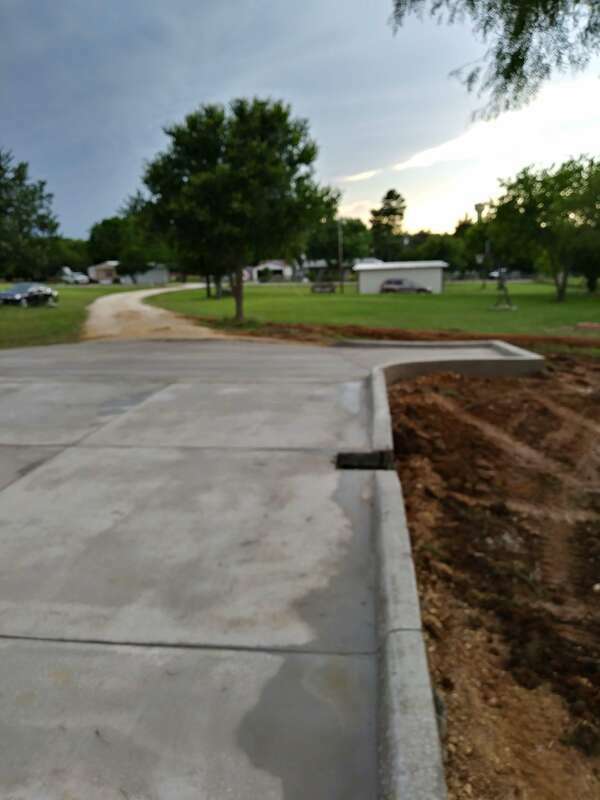 There was a minimal amount of grading needed to smooth out the existing base and then the asphalt laying machine went to work. The asphalt guy did a great job. 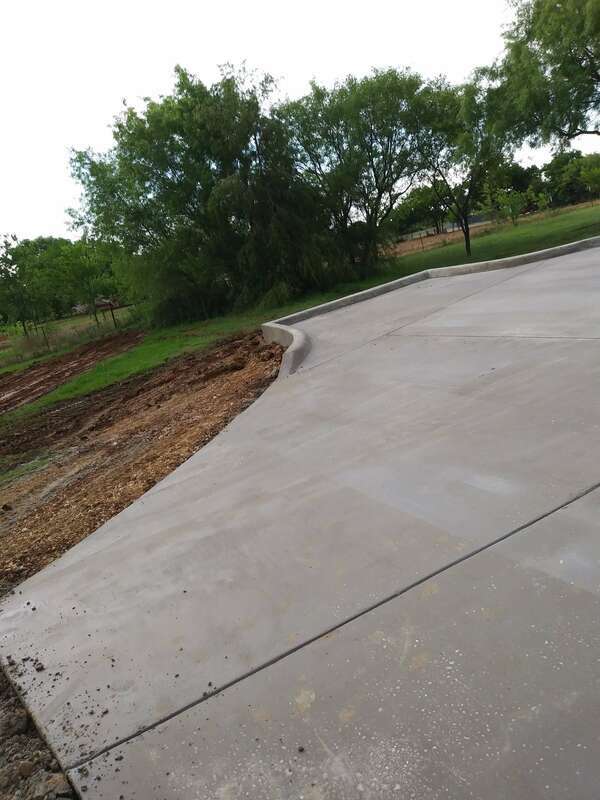 We have about three inches thick of uniform asphalt and that meets up to the new concrete parking area. We were so excited about this project and it turned out just the way we envisioned! 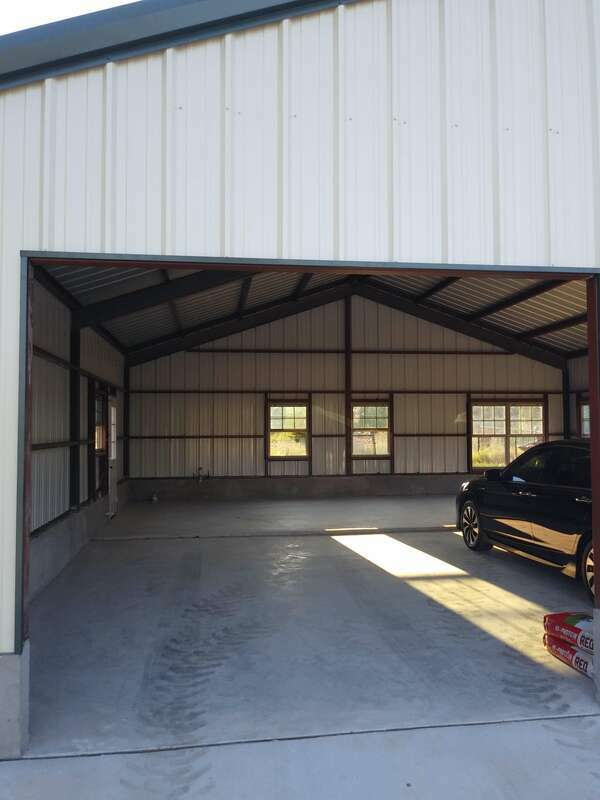 Detached metal building Garage Addition with office and restroom! 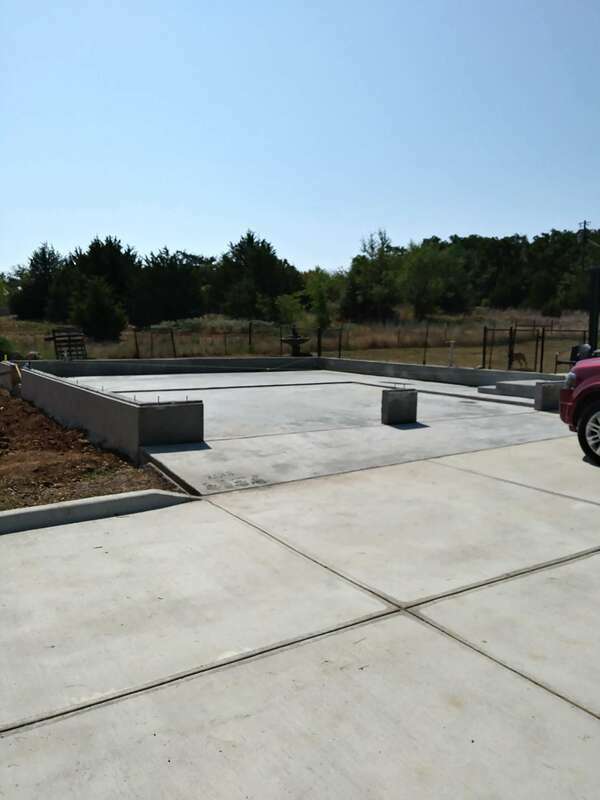 When we installed the concrete addition for the parking area it was set up in anticipation of building a detached garage. 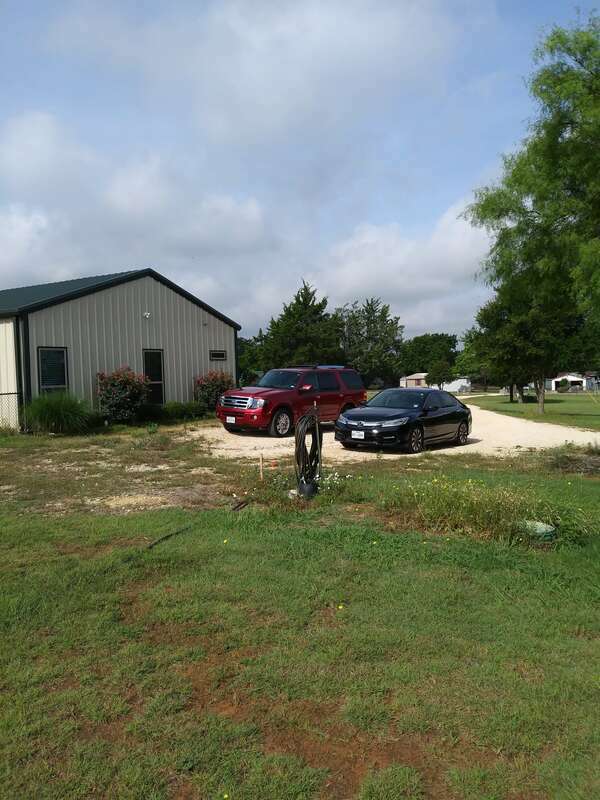 Our property goes up hill as you go towards the back property line. 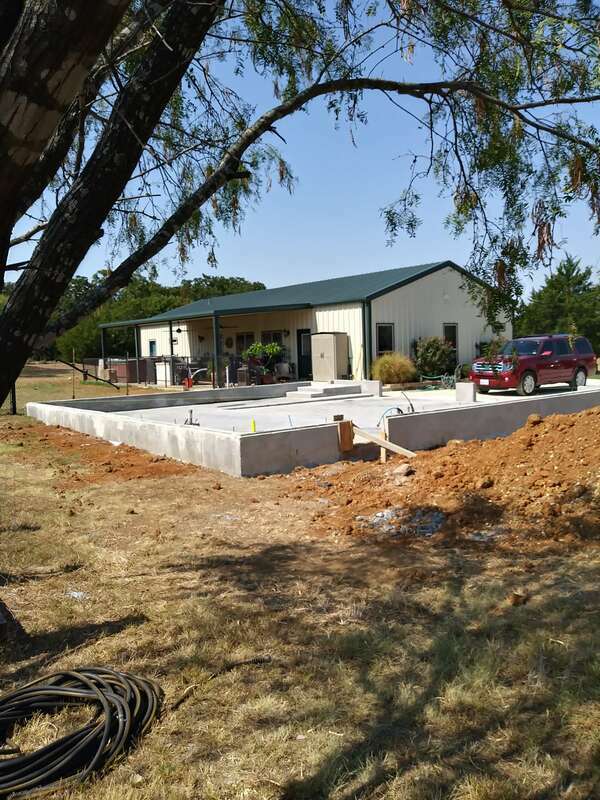 The detached garage was posing some challenges because where we wanted to place it the building pad was going to be higher than the house. 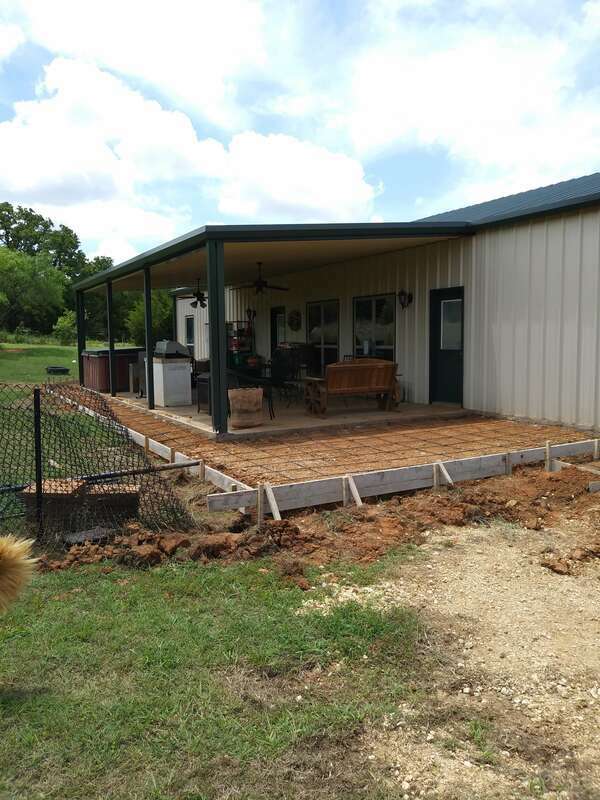 ​I came up with the idea to inset the detached garage in the ground instead of building up a dirt pad. After checking a lot of elevation measurements I determined it could be done. 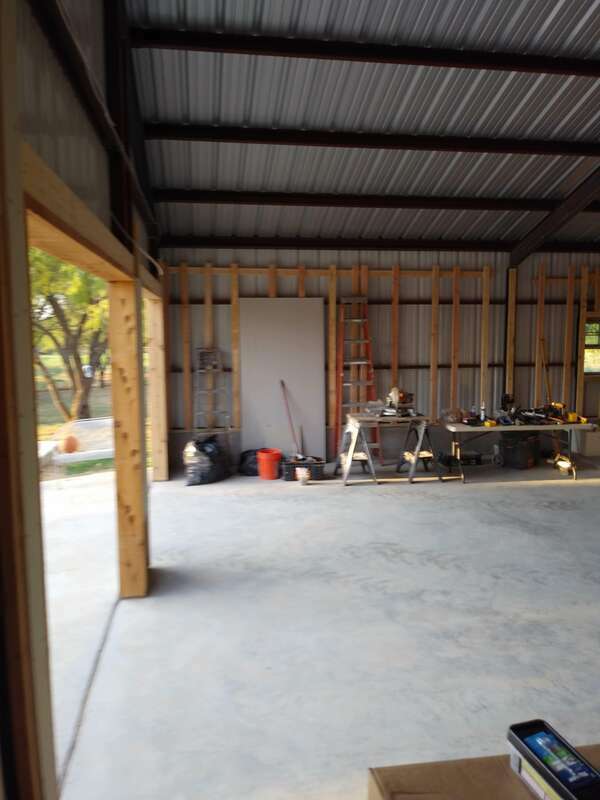 We had to build stem walls into the concrete foundation design so that the floor of the detached garage could be below ground level by about 10 inches at the back right corner and all along the right side. 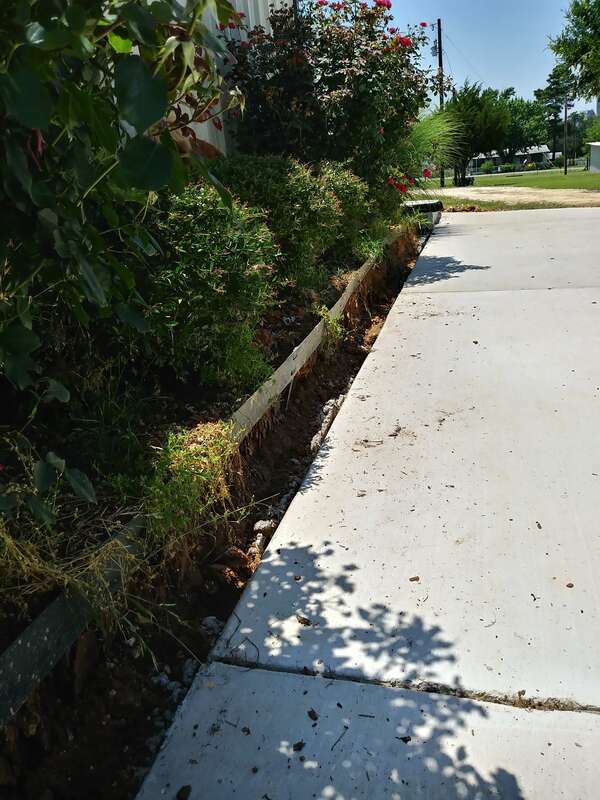 ​In consideration of drainage being affected, the concrete stem wall also allowed for regrading the dirt at a height where we were able to make all of the back yard drainage flow towards the other end of the house. This created a big plus because that side of the house drains directly into our pond. 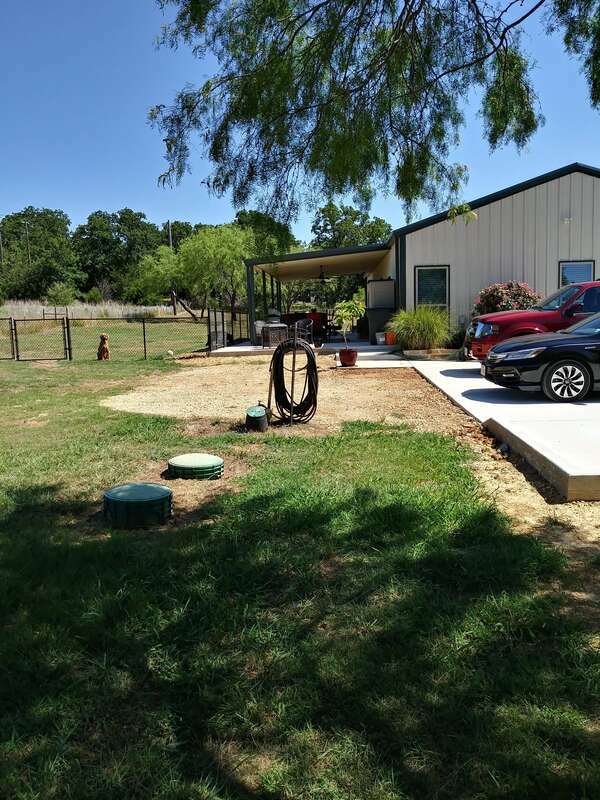 So we ended up being able to route more ground water drainage towards the pond to help keep it full. Now that I had the site plan worked out, I worked on finalizing my floor plan and building design for the dettached garage addition. 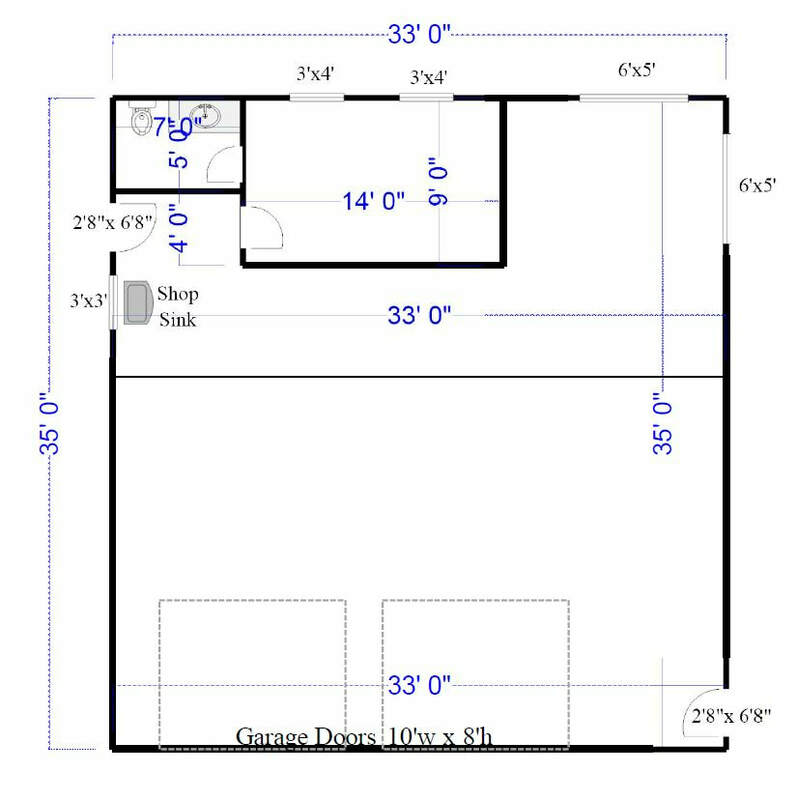 I utilized a web application called SmartDraw to create the scaled plan drawings myself. With plans in hand I worked through the estimating process and met with all the necessary contractors. 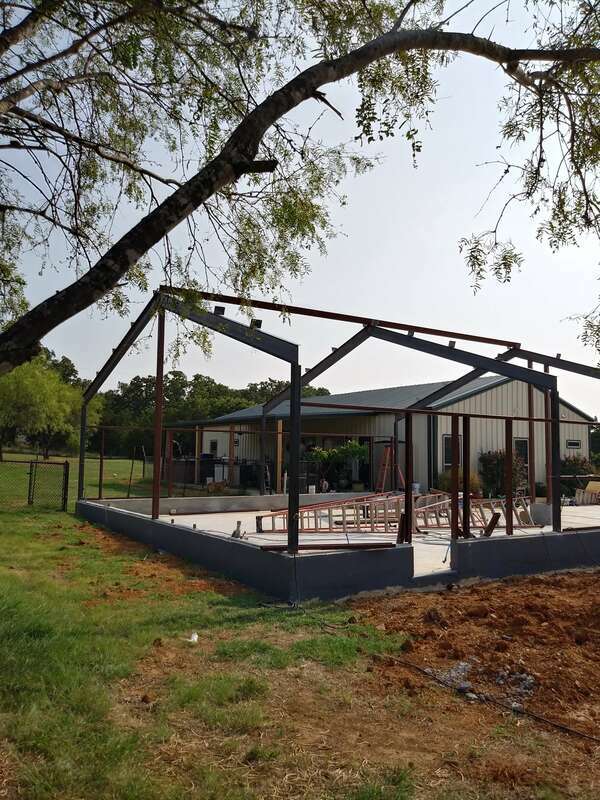 The biggest challenge I had with getting this project rolling was finding a custom metal building fabricator for the detached garage. 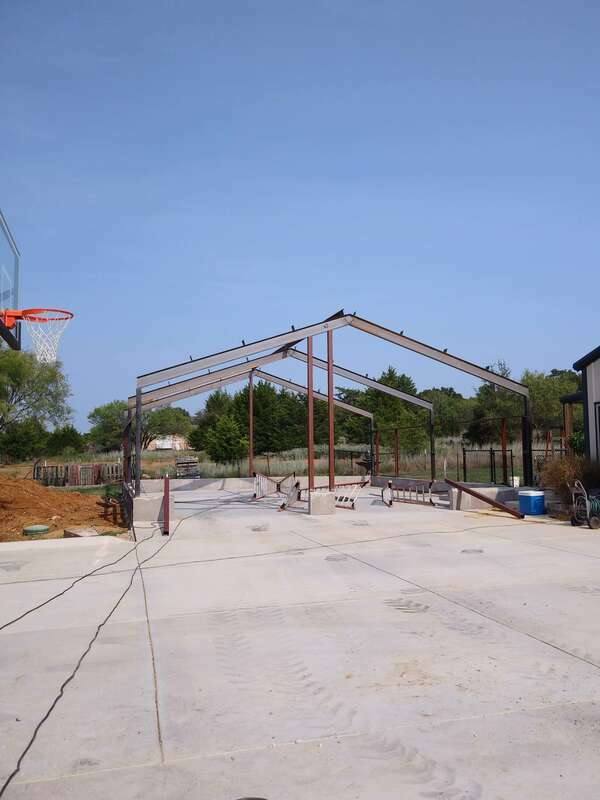 The contractor I used for the house in 2011 was busy building big air craft hangers. He said they couldn't help me with this small project. I was bummed but understood and I'm glad business is good for them. 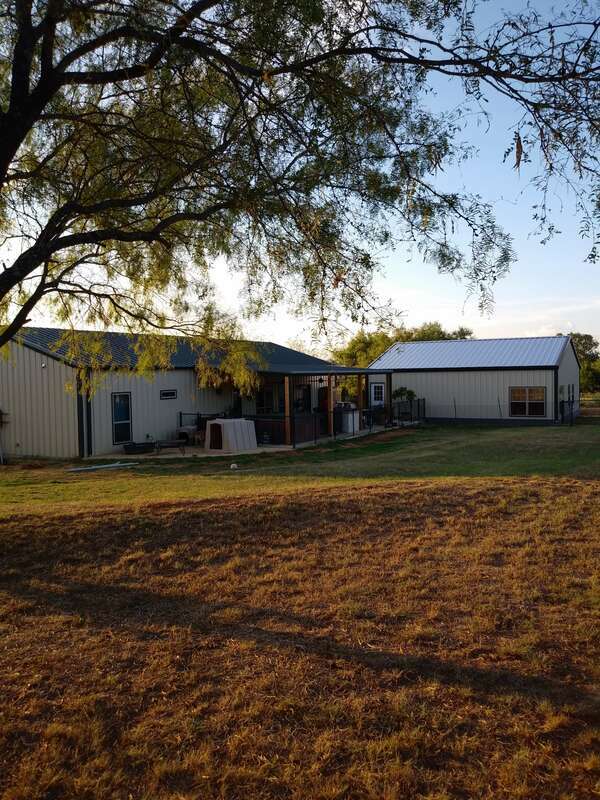 Luckily I was able to get in touch with one of Erica's (my wife) teacher co-workers whose husband runs his own custom metal building fabrication business. I was able to meet with him and line out all of the details very quickly because I had good plans and the whole project lined out. He was about six weeks out to be able to start, which was fine by us. 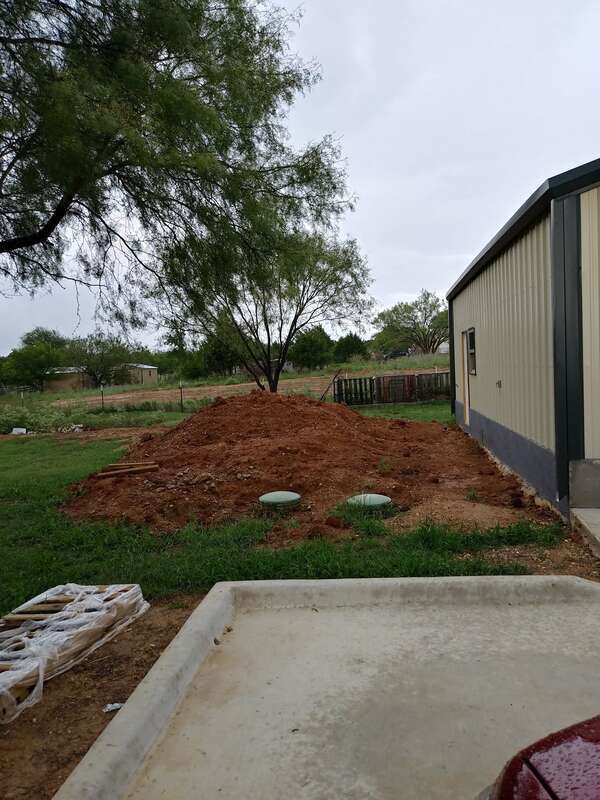 I had to get electrical service to the new building from the meter base that's at the other end of the house about 115 feet away. 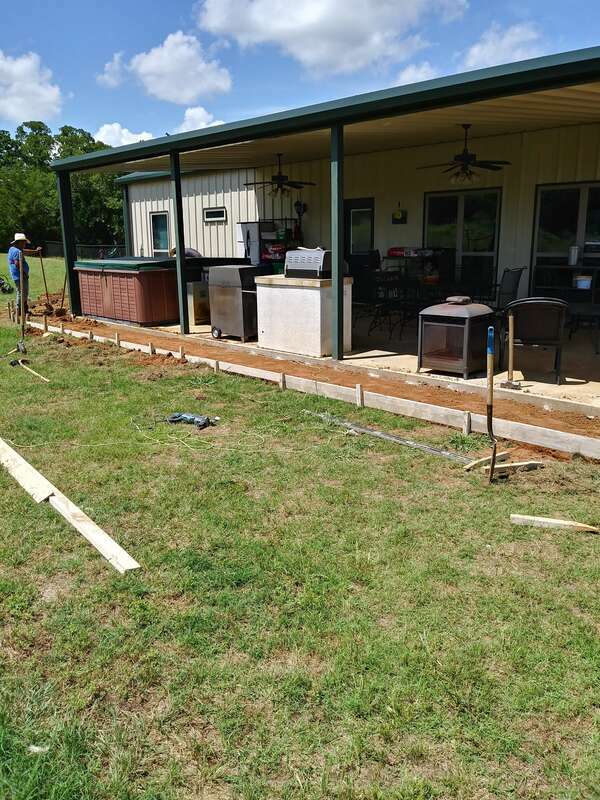 Using a mini excavator borrowed from the concrete contractor, we trenched between the new building and the existing electric meter on the house. 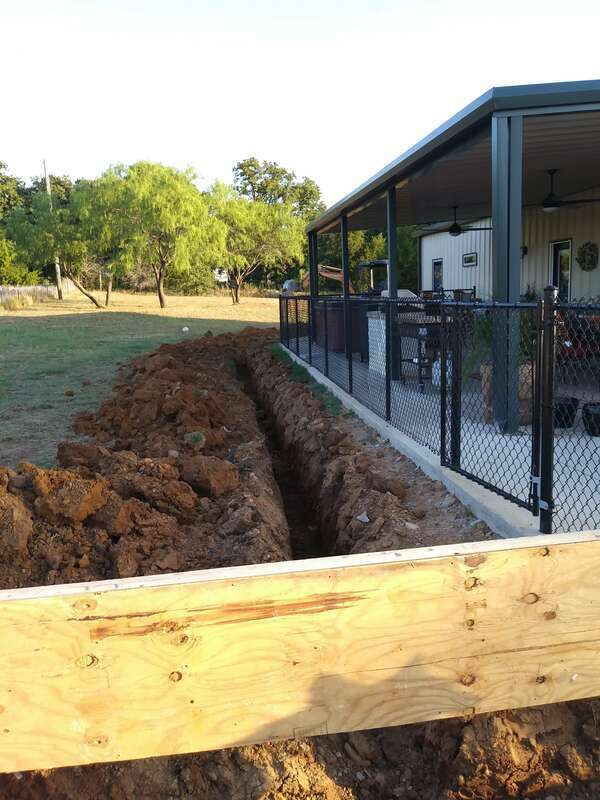 Then we installed conduit in the ground for the electric service wires to be pulled through. 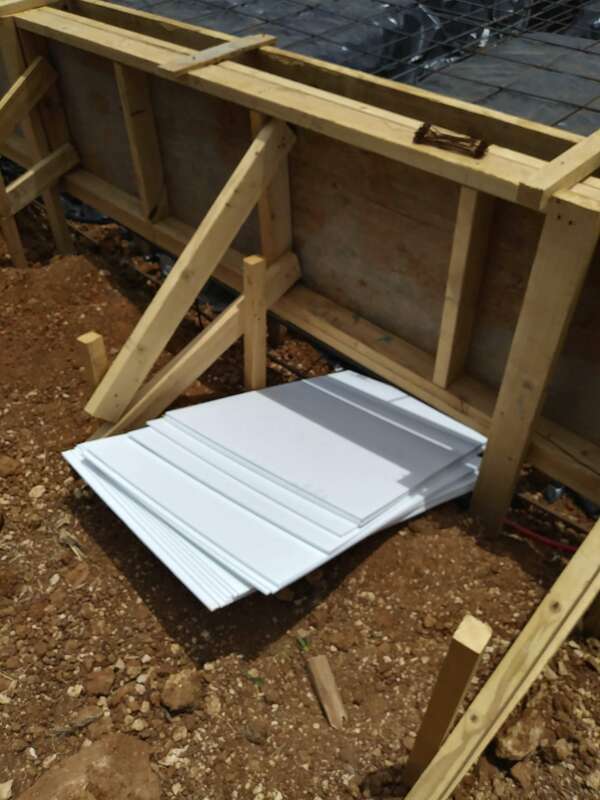 ​The conduit comes up through the new garage foundation directly into the wall. 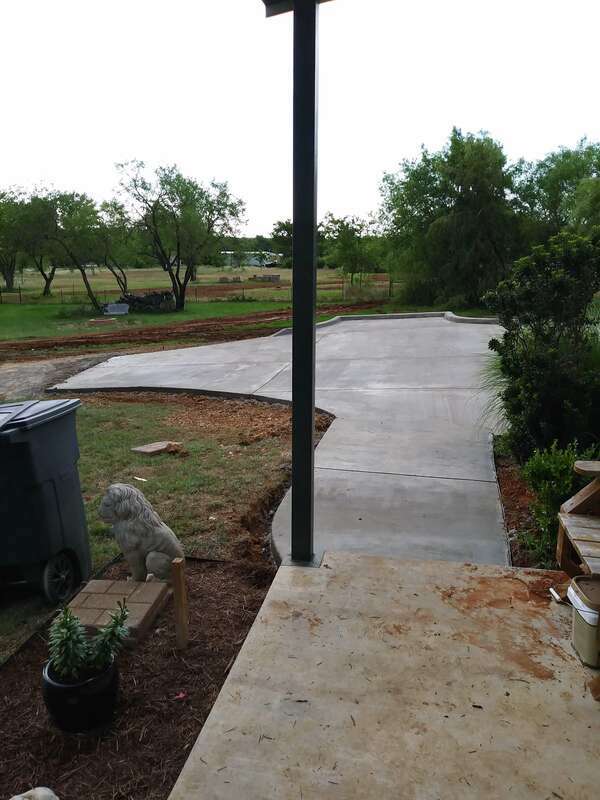 I planned to put a service disconnect for the detached garage by the meter base. I bought a new meter base from the electric co-op that had more lugs to connect the new building and the house service directly to. This kept from having to take the new wiring into the house's electric panel. 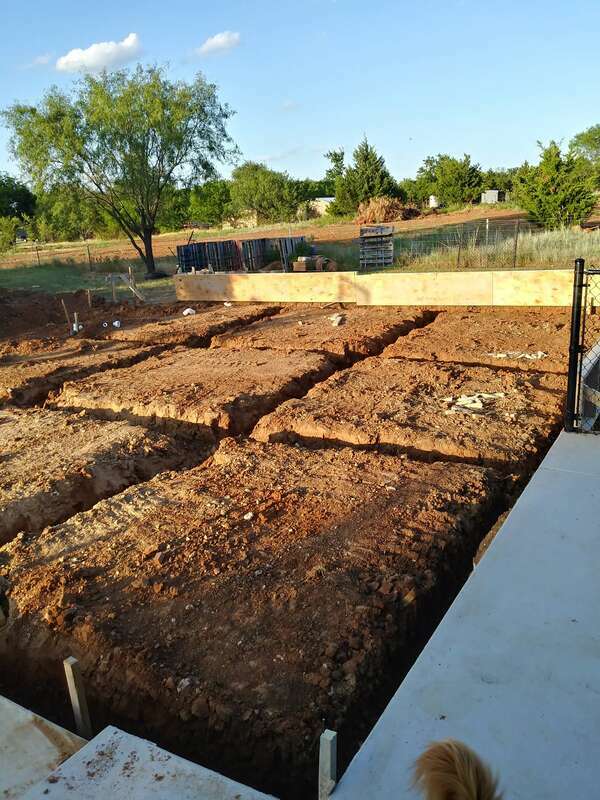 Building the slab on grade foundation with the stem wall was quite a bit more work and cost than just a flat slab, but it was worth it. 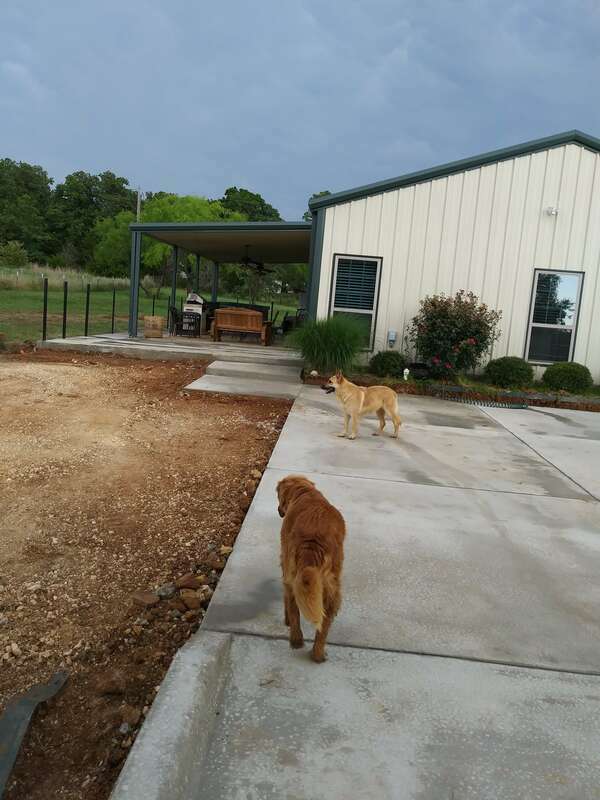 The concrete contractor I previously hired for the concrete addition work was too busy to get to my project in the near future. I had to find another concrete labor source, but I was able to do that relatively easy. 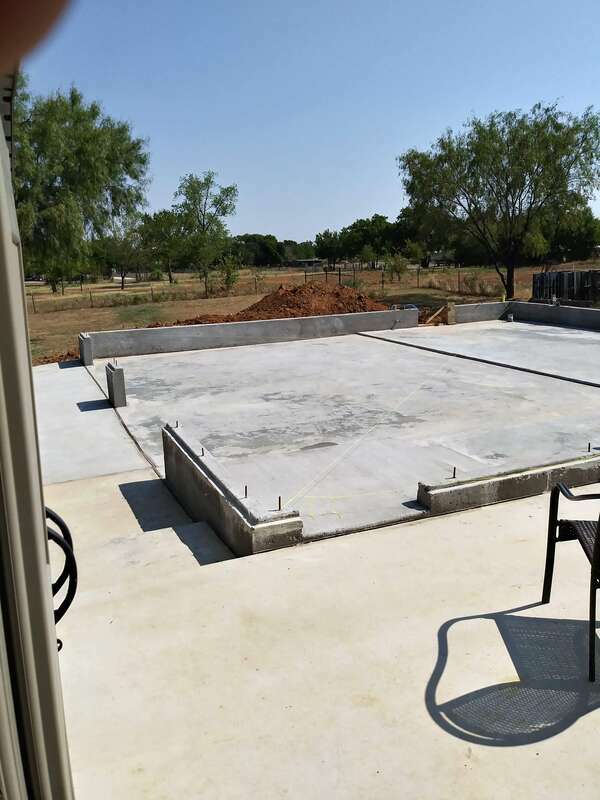 So I got busy on the foundation and had it ready and waiting for the metal building fabricator. After the foundation form boards were removed I applied a product to the outside face of the concrete stem wall to water proof it. 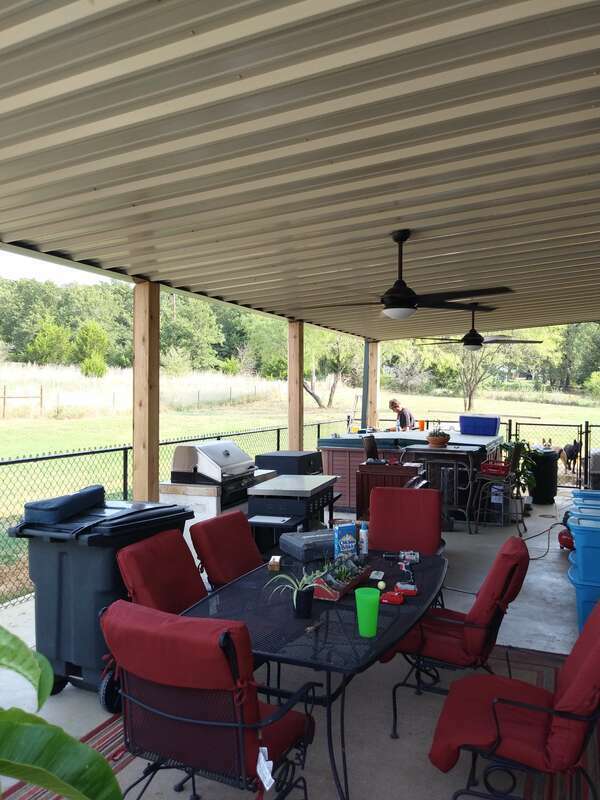 I found a product called DECO 20 Seal online and ordered a 5 gallon pail to roll on in several coats around the whole perimeter. This ensured the portion of the foundation stem wall that would be underground was water proof. ​I had to have the windows and exterior doors onsite for the building erector, so I got those ordered and delivery set. 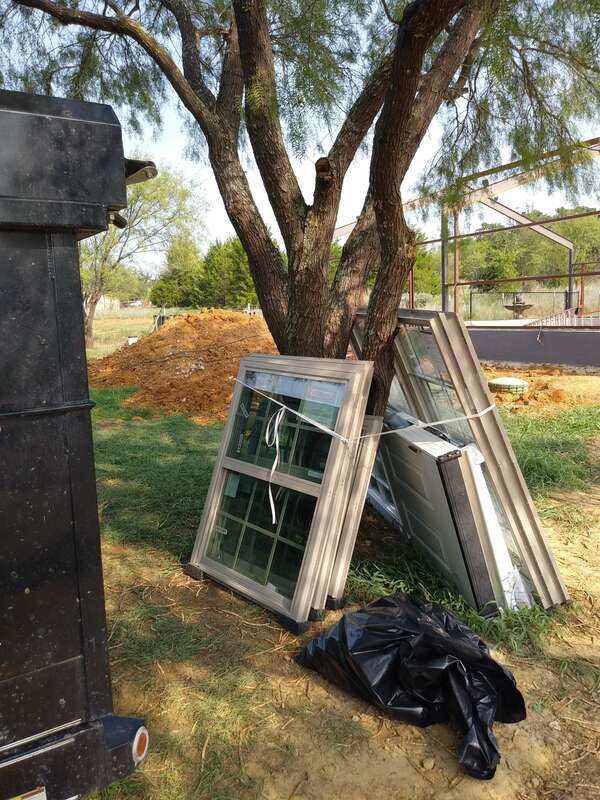 I was able to order the exact same windows used for our barndominium home from the same supplier we used originally. 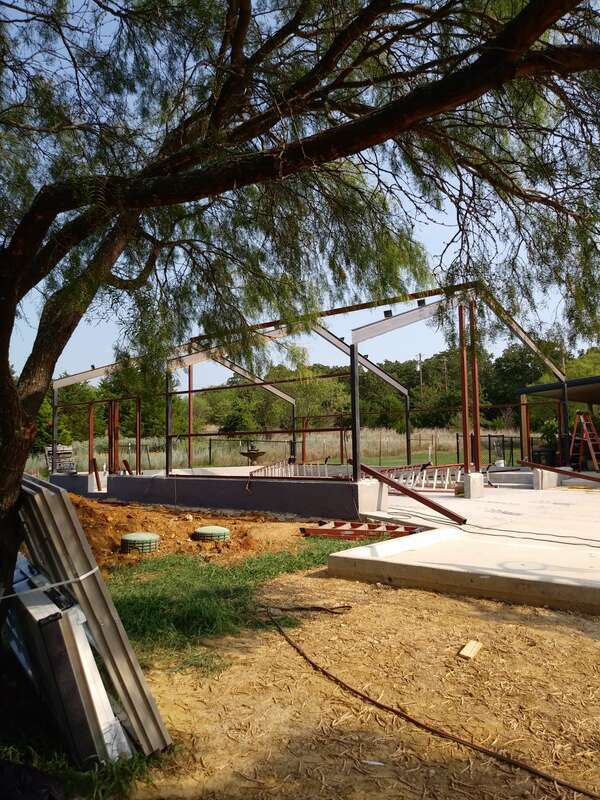 ​Once they got started on the metal building it moved very fast. 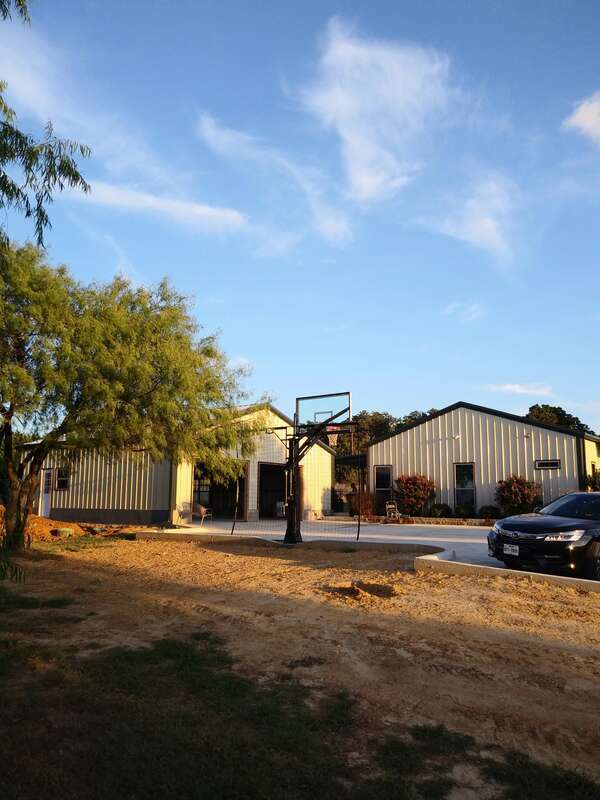 We had a completed metal building in just five working days. Couldn't be happier with the craftsmanship. 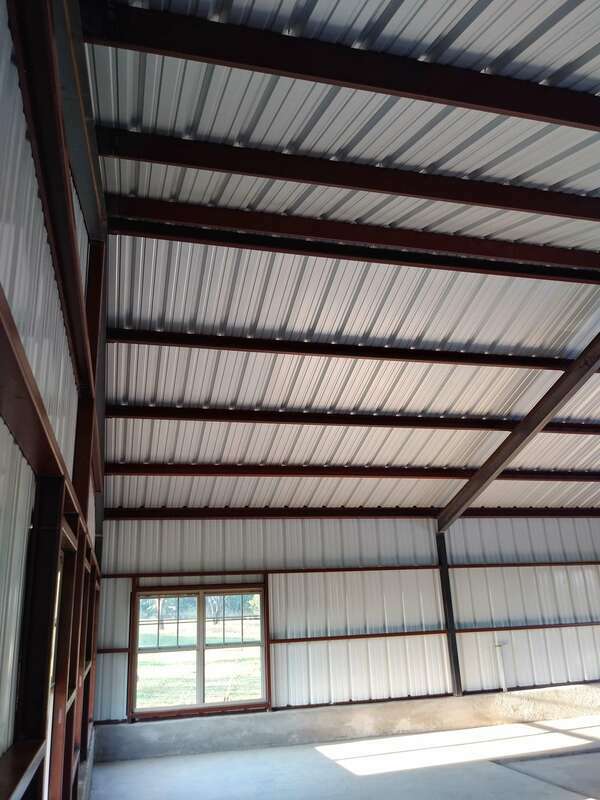 This new building was welded just like the house, but we used i-beam steel for the roof structure on the garage compared to the A-frame type roof rafters on the house. 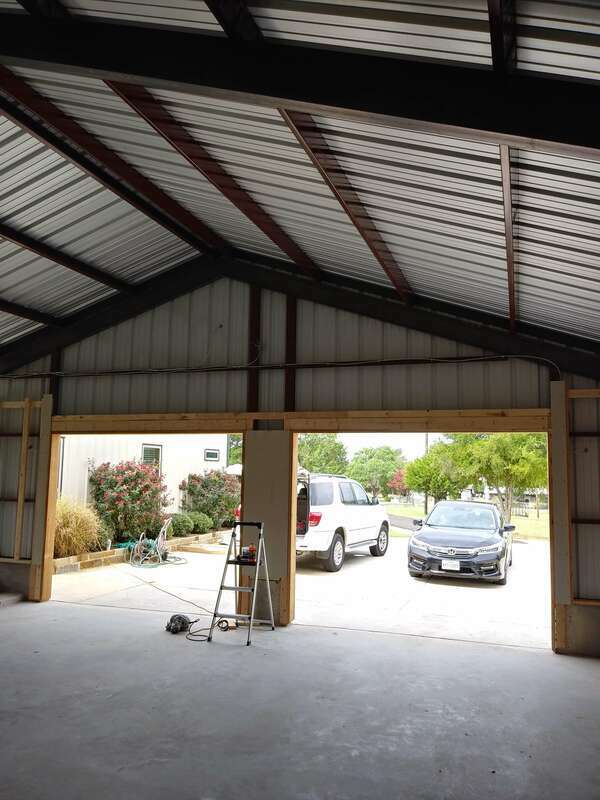 Since we were not going to put a ceiling of any kind in the garage I actually preferred the high unobstructed open ceiling the i-beams created. 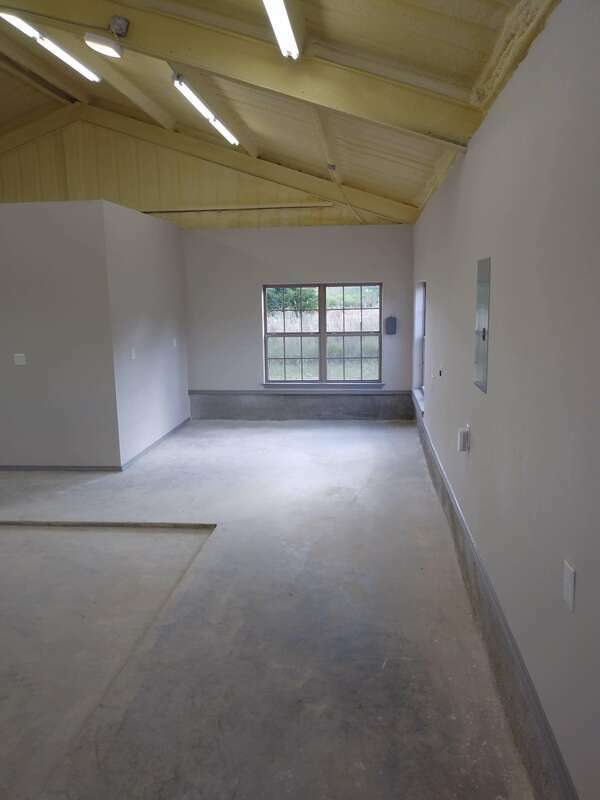 ​The one other major difference between the barndominium house and the new detached garage is we used galvalume roof sheeting instead of green like we did on the house. 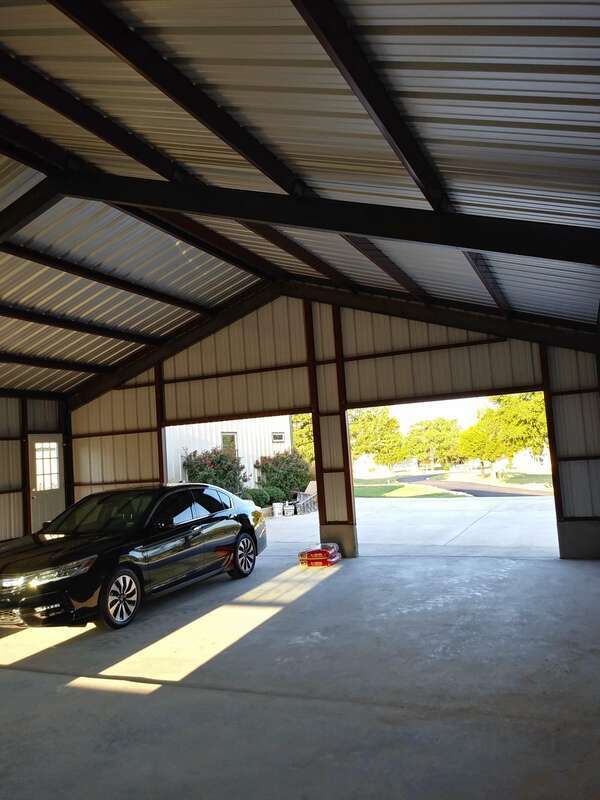 The galvalume's highly reflective nature is sure to be a benefit to the temperature inside the garage in the heat of the summer. 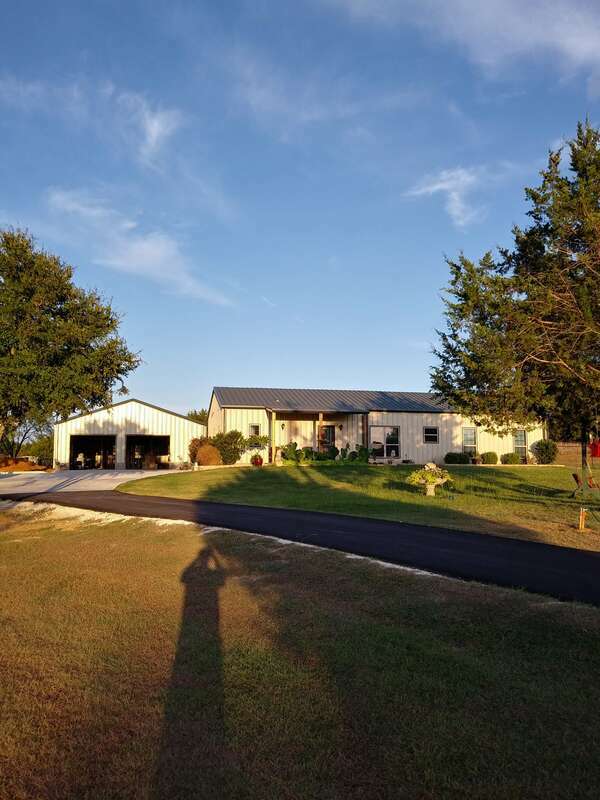 Because the roof line gable of the garage is oriented opposite of the house, you can't see the roof of the detached garage from from the front of the property. Once the building was up I had a multi faceted contractor on standby to complete the interior finish out. 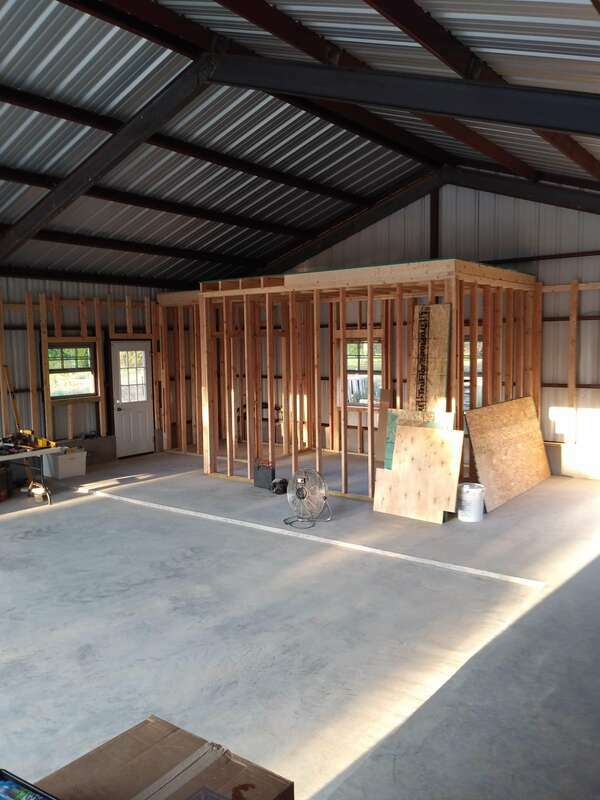 They started framing the interior walls within a couple of days following the metal building completion. He had his own plumber that had also done the rough-in. ​Luckily I was able to use the same electrician that wired the house seven years prior. He pulled the 4/0 AWG aluminum electric service wires through the conduit in the ground. The electric co-op came and killed power at the transformer so my electrician could swap the meter base and install the disconnect. Then they came back later that day and restored power. 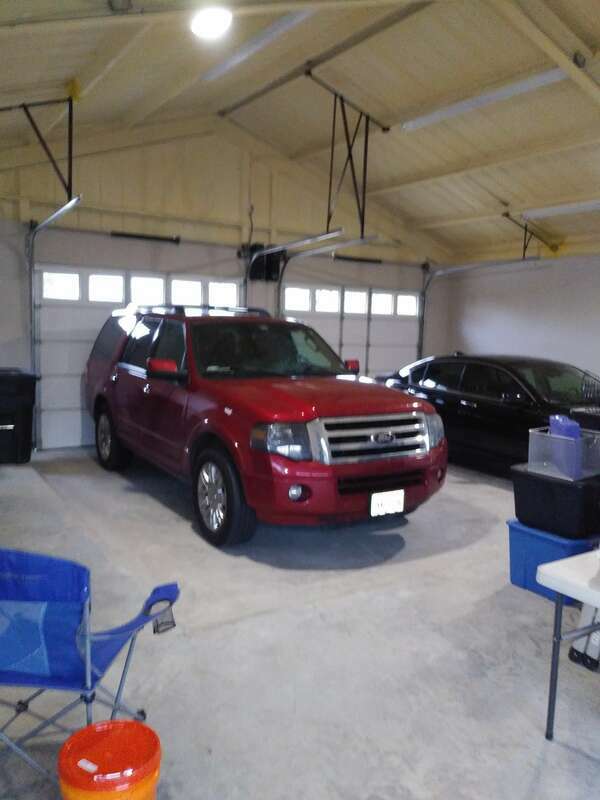 We installed a 200 amp electric panel in the new garage. I wanted to be sure there was all the service and breaker options that could ever be needed. We built a craft-room / office space with a bathroom in the back of the garage. The roof of that interior area is decked with 3/4 inch tongue and groove flooring to make a nice strong storage area up top. We also put a shop sink in the main garage area. Both sinks are fed hot water by a 220 volt instant on tank-less hot water heater. The water heater needed 6 gauge wire for its power so I made sure we had the appropriate electrical circuit for that. I had a timer circuit with ceiling electrical plugs installed in the back right hand corner for future grow light use (greenhouse type area mainly for winter plant storage). We also had large windows installed in that area that point east and south. That way we take advantage of the daily sun in that corner, but we also have the timer for future use if we want to install grow lights. ​I also had a 50 amp wall plug installed just in case we ever want to plug in an electric welding unit or possibly have electric vehicles in the future that need high amp charging capacity. 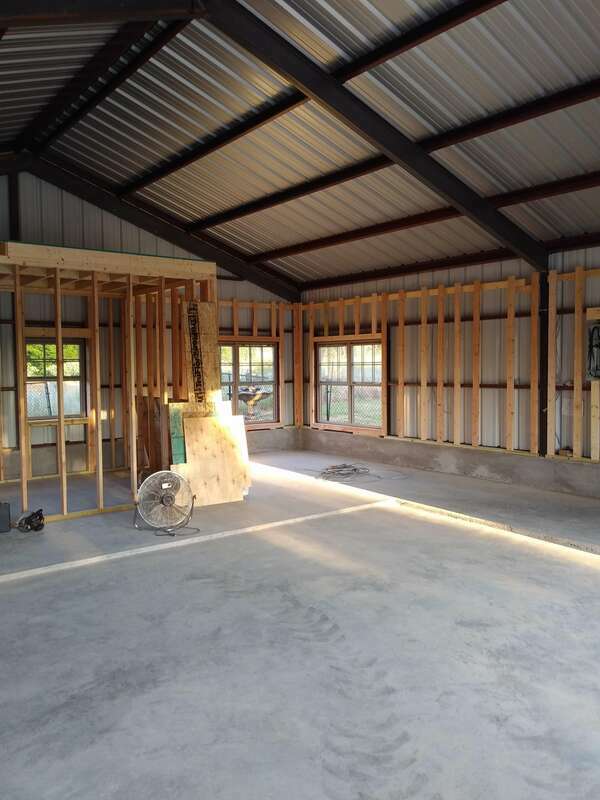 The electrician and plumber completed their top-out work after all the interior wall framing was up. 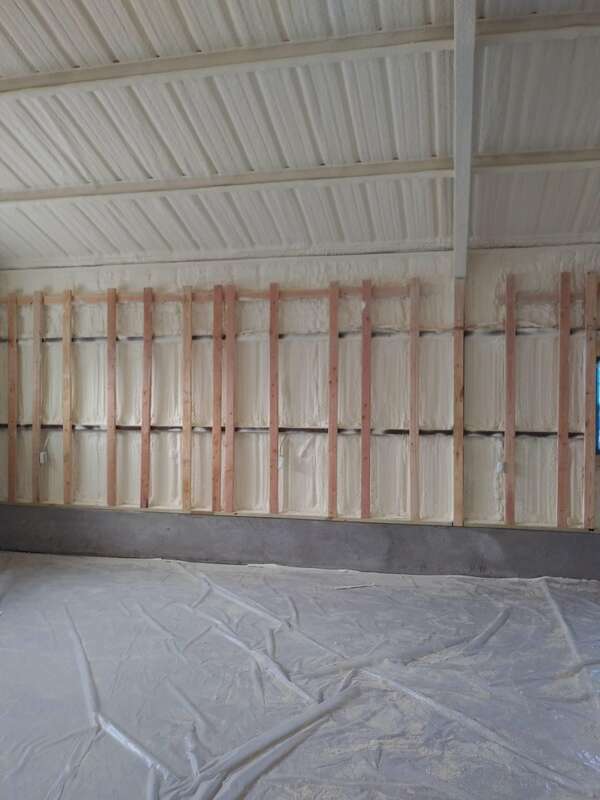 The spray foam insulation contractor recommended that we have all of the electrical and plumbing in place within the walls beforehand, so that is what we did. 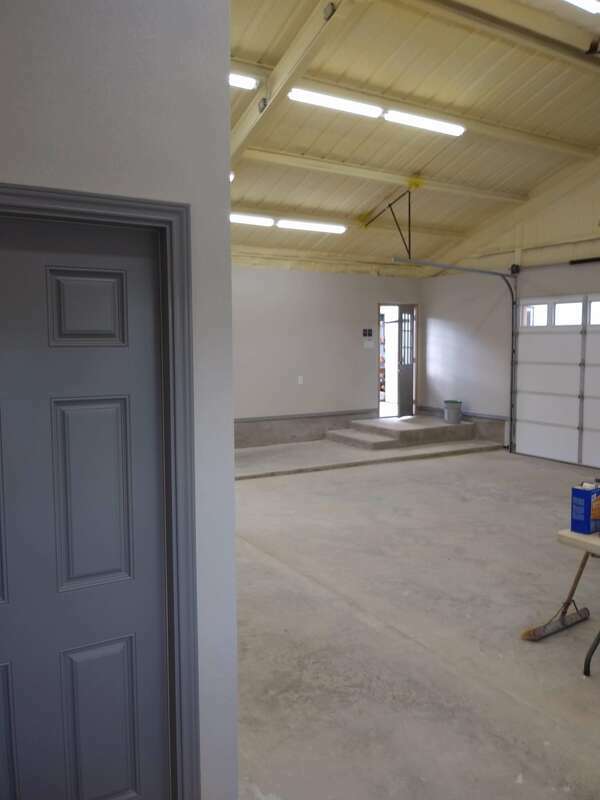 The garage doors were installed by a local garage door company. 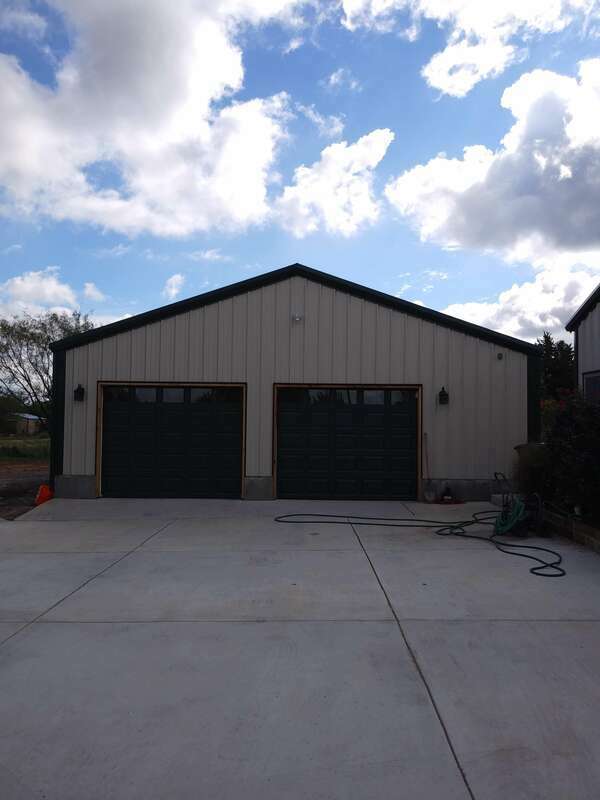 The garage doors are 8 feet tall by 10 feet wide. It's really nice to be able to drive in and out of the garage with little consideration of your side mirrors. 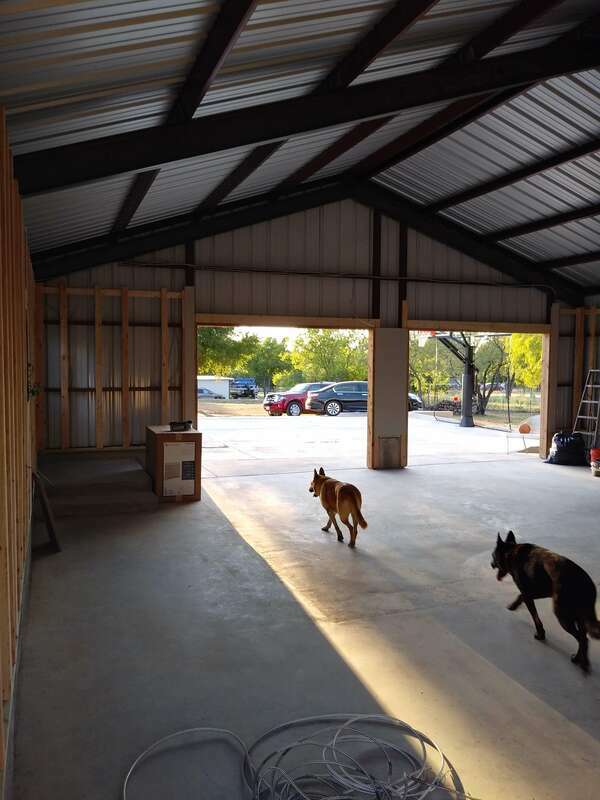 The garage doors have foam insulated panels and we had the tracks positioned so that they raise at a slight angle instead of going straight back when open. 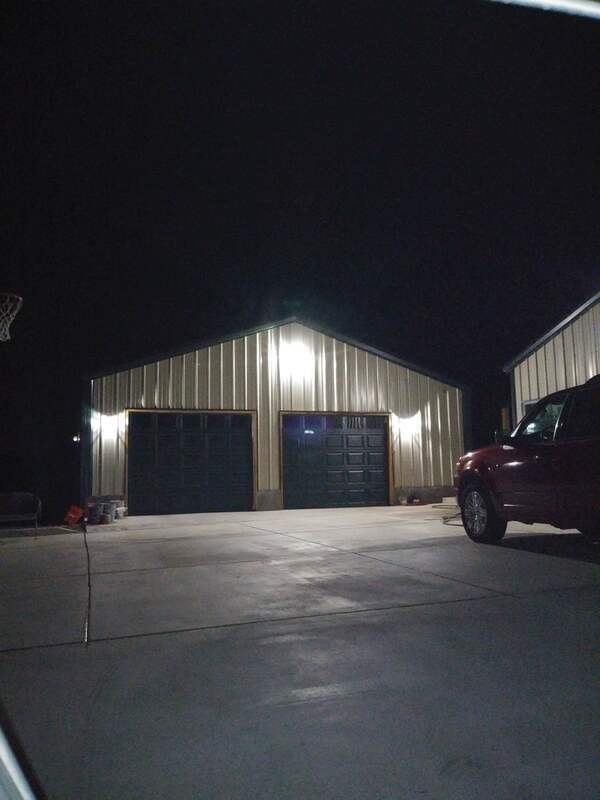 That gives a little higher head room when the garage doors are open. 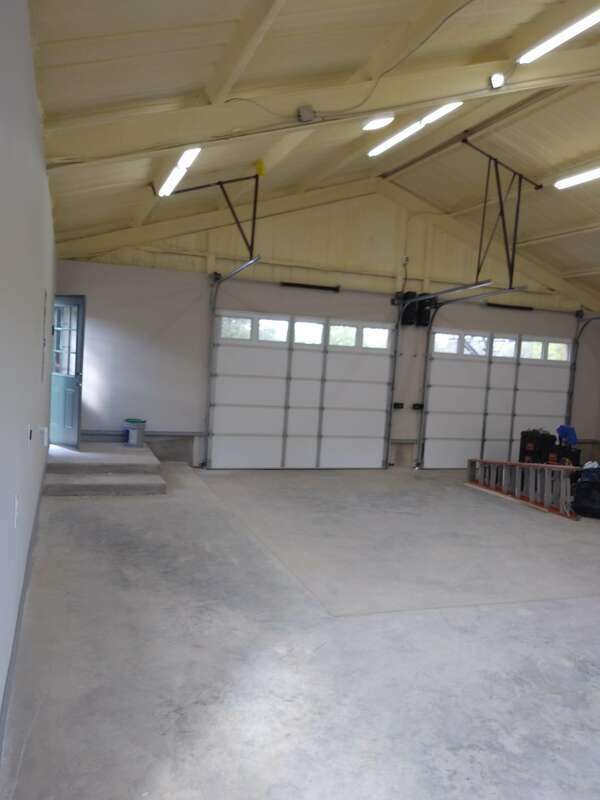 We also utilized jack shaft garage door operators that mount on the wall beside the garage doors, so there is no overhead unit hanging down to operate the garage doors. 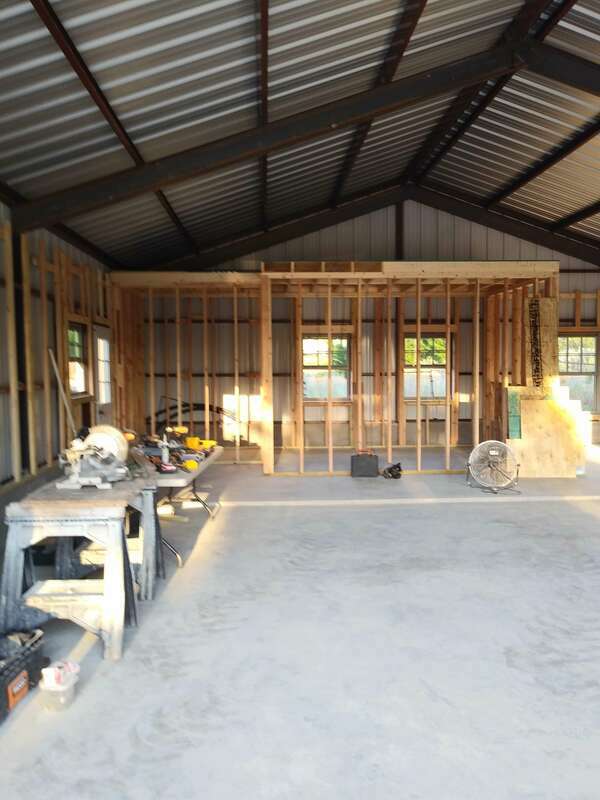 After the interior wood framing was completed and the garage doors were installed the spray foam insulation contractor came in and spray foamed the whole interior of the building shell with 2 inches of closed cell foam. That really strengthened the building and made it virtually air tight. The 2 inches of spray foam definitely has a meaningful insulation R-value, but the key is that it made the building completely air tight. Being so air tight the temperature inside holds very steady throughout the day and weather changes. When we had twenty degree weather the first winter the temperature inside never dropped below forty degrees. Sheetrock started going up the next day after the spray foam was installed. 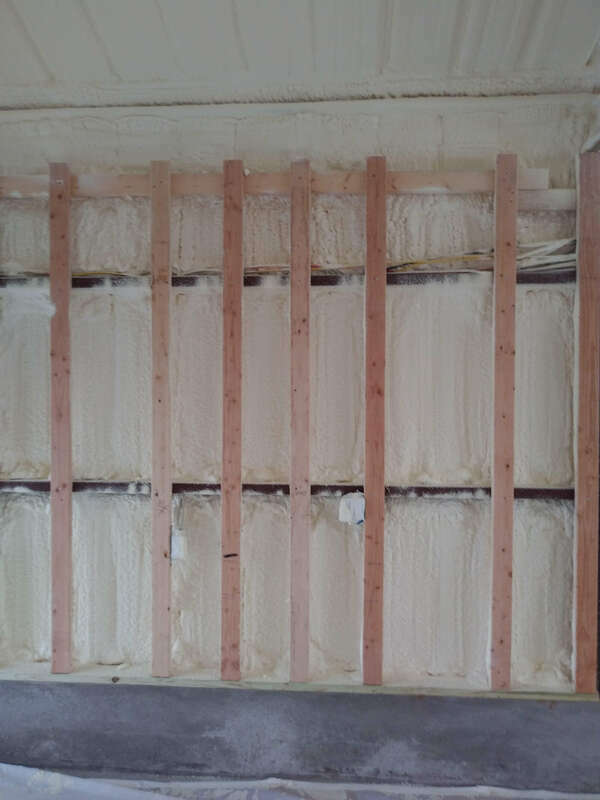 We insulated the interior room and bathroom area with R-13 batt insulation in both the walls and ceiling. After tape, bed and texture was completed they were painting the next day. 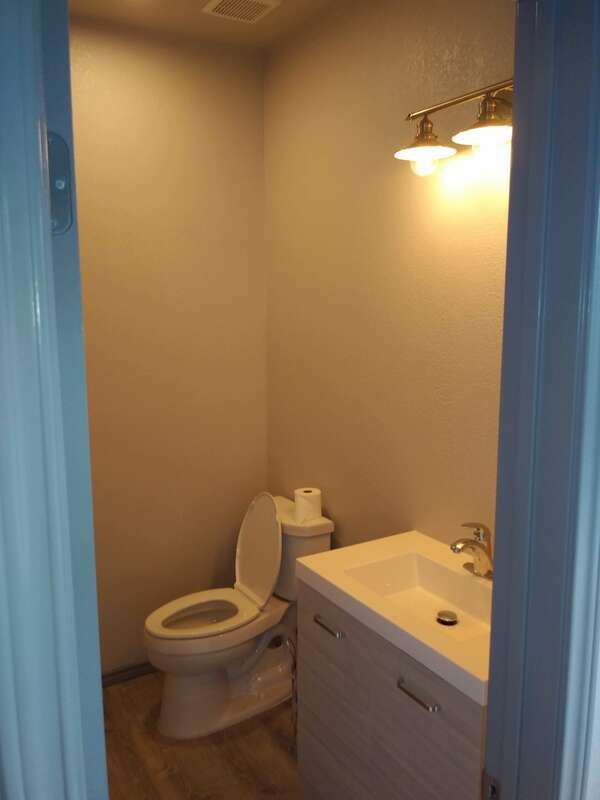 When painting was done the electrician came back and finished installing all of the fixtures. Before we knew it the flooring was going down in the room and bathroom. 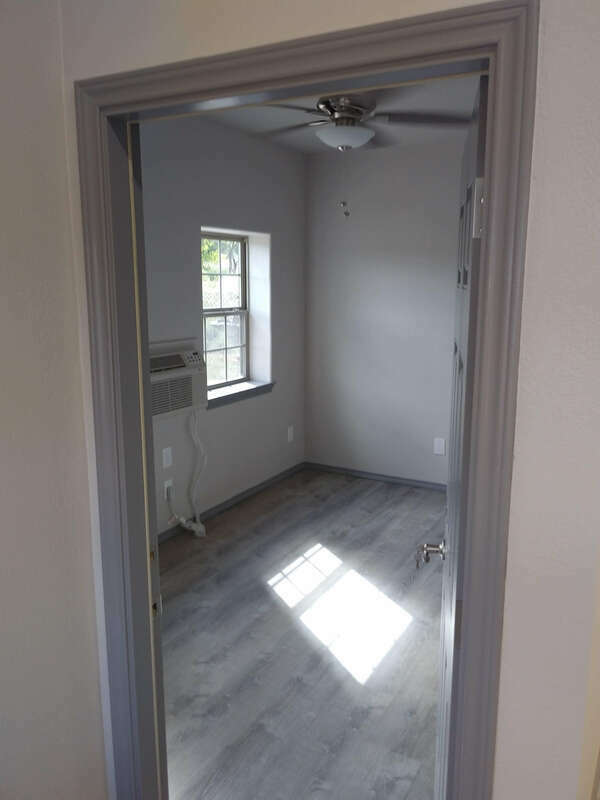 We found a snap lock plank style flooring at Home Depot that we really liked. 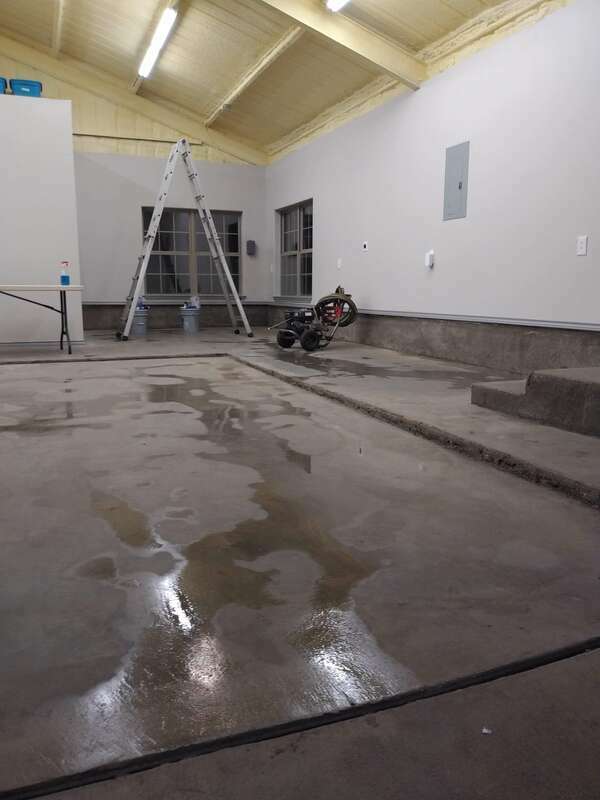 ​After the flooring was down they installed the vanity and toilet in the restroom along with the shop sink. The last detail was installing the PTAC 220 volt HVAC unit in the wall in the interior space. I found a nice little unit with heat pump. It's just like the units you see in hotel rooms, but about half as wide. 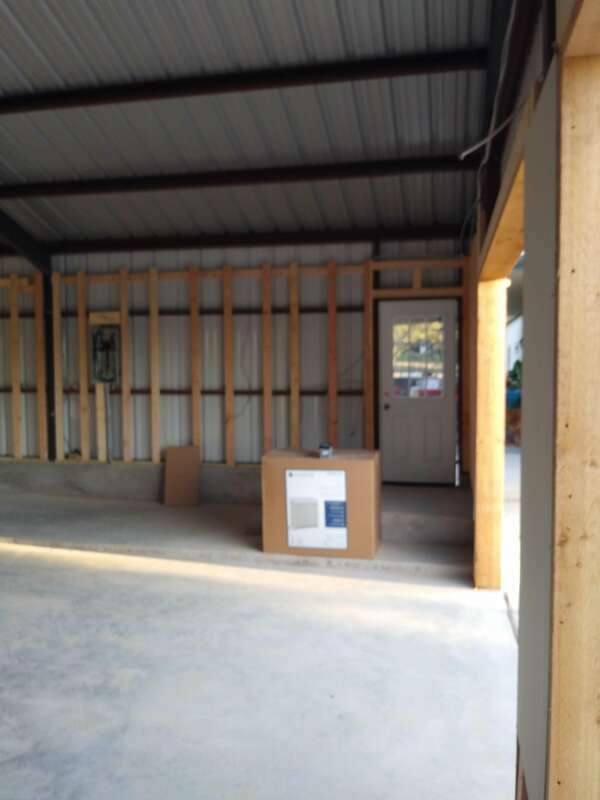 There was a hole cut in the wall of the building and the interior wood framing was setup to accommodate the in wall installation of the PTAC HVAC unit. The next couple of days the guys were cleaning up, touching up items and making other minor adjustments. 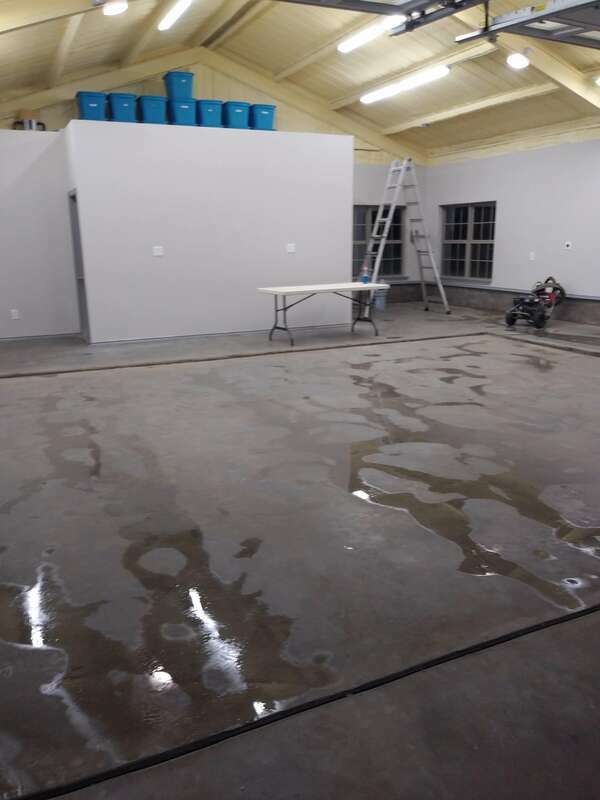 The last step included pressure washing the garage floor. The very next day we had storage totes up top, plants being moved in for winter storage and both cars parked inside. It was a beautiful site! 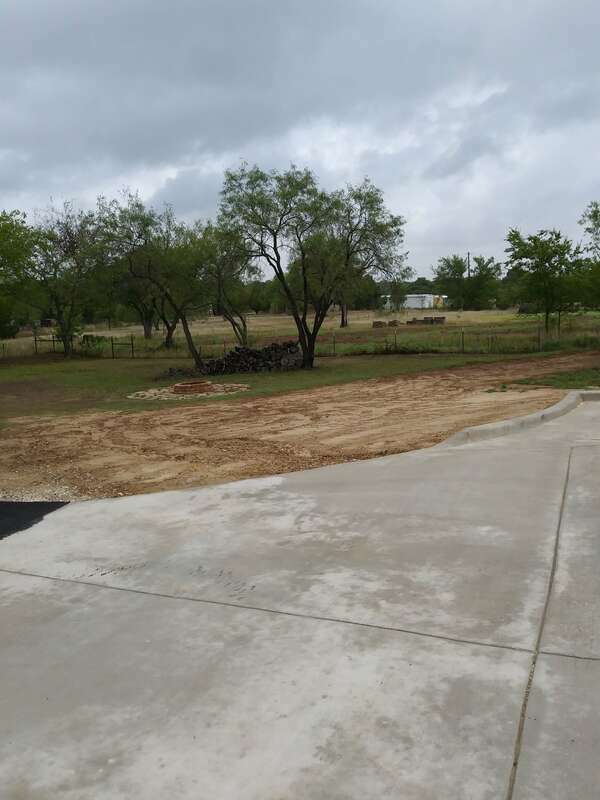 The only remaining item I had to get done was the final dirt grade work for the surrounding yard. I had a skid steer guy out the following week and we got that handled. We tried to establish some grass seed right away, but the weather turned cold on us and that didn't take. Have to revisit that in spring! 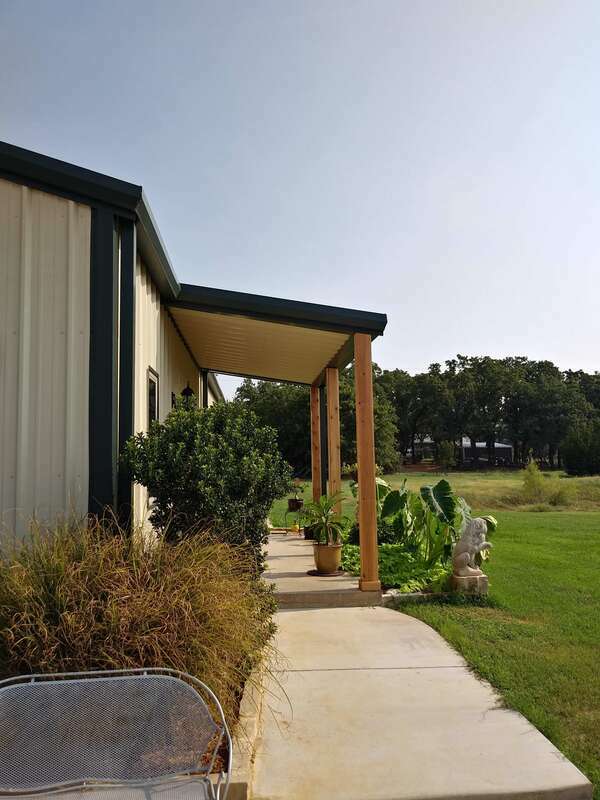 If you haven't already, be sure to check out our Texas Barndominium Home Construction Process. 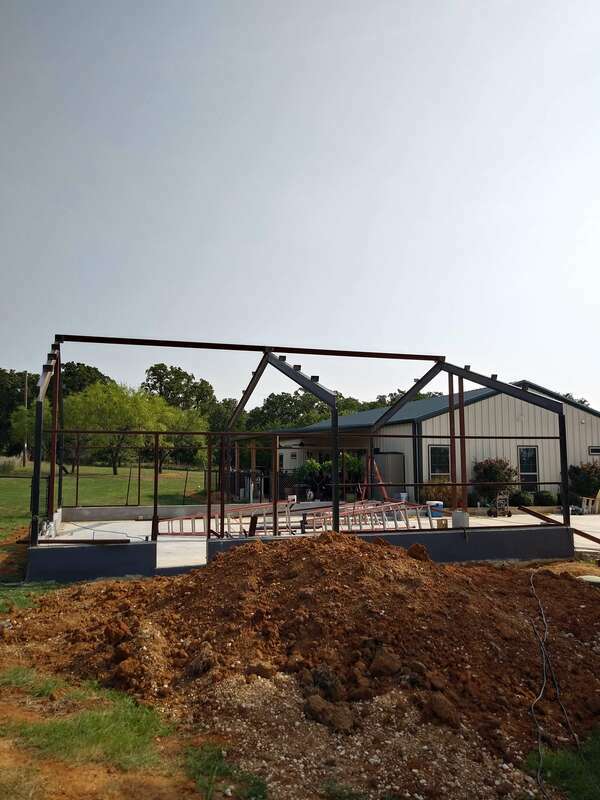 The attached PDF file are the basic plans used to build the detached metal building garage.